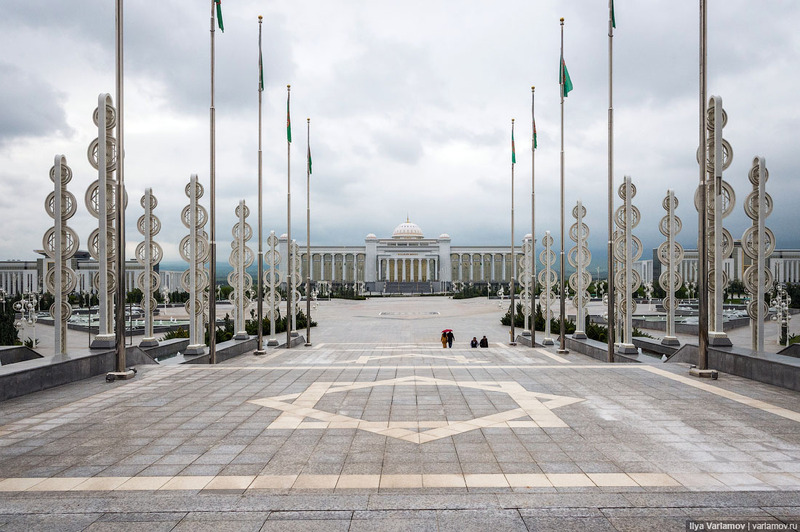 “Where are all the people?” – this question often arises when people see photos of the white-marbled capital of Turkmenistan. 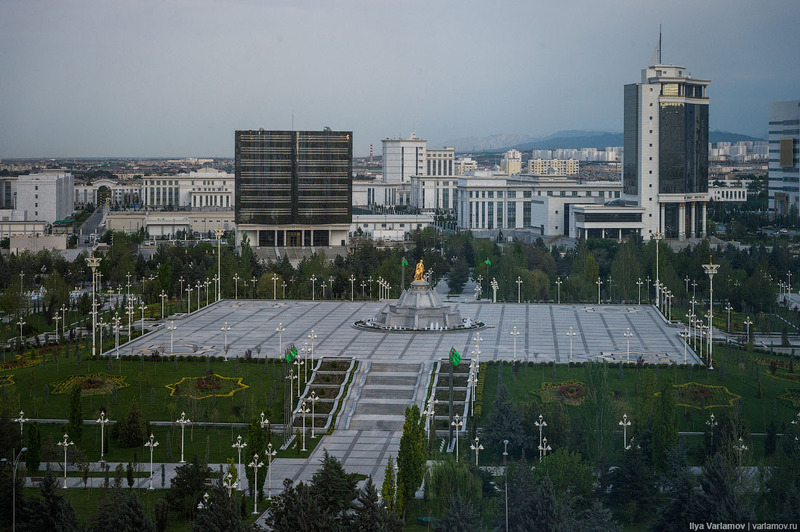 Indeed, new Ashgabat looks empty. 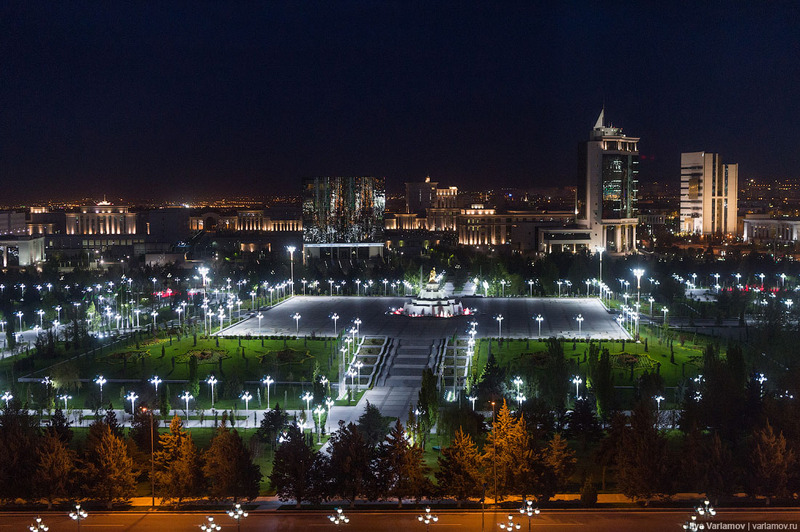 Huge new buildings lined with marble, wide avenues, parks, gardens, fountains are all there, but there are no people in the city. 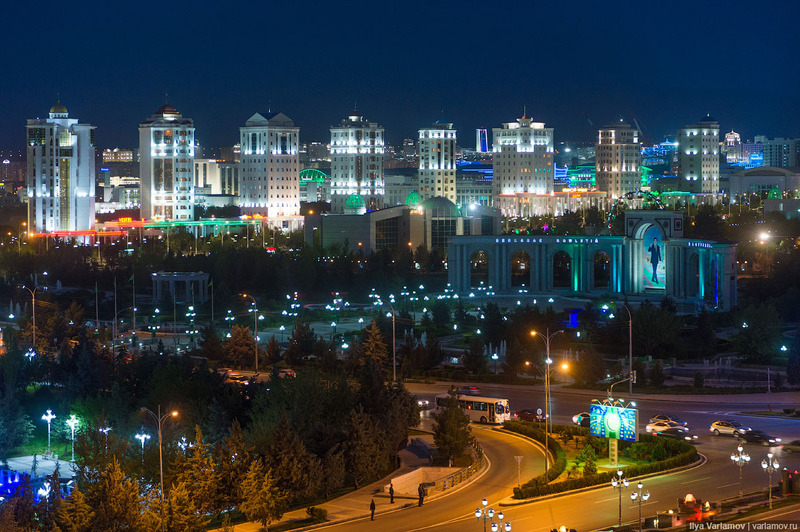 Ashgabat is divided into two parts – old town and new town. City of the living and the city of the dead. 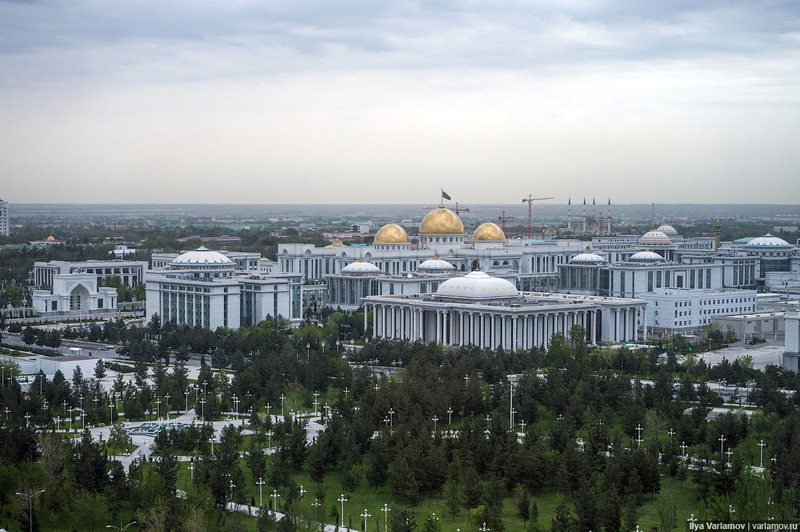 The great Turkmenbashi founded new Ashgabat in the early 2000s. 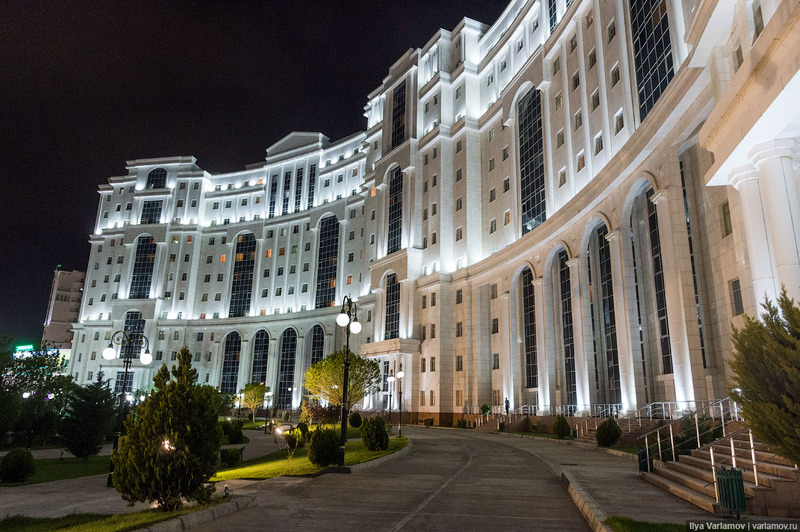 It was he who decreed that all buildings are to be built with white marble. 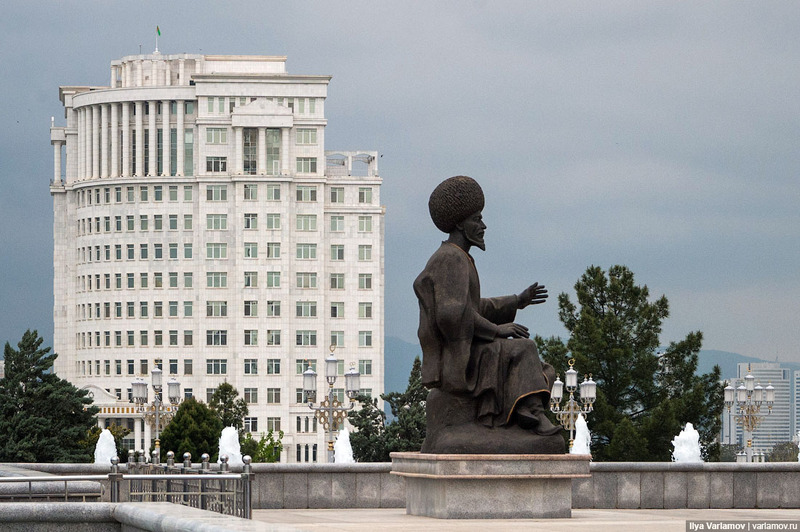 “We shall only build with white marble,” Sapurmurat Niyazov once said. “Greedy people don’t get it, they seek for other materials, we have to give orders”. 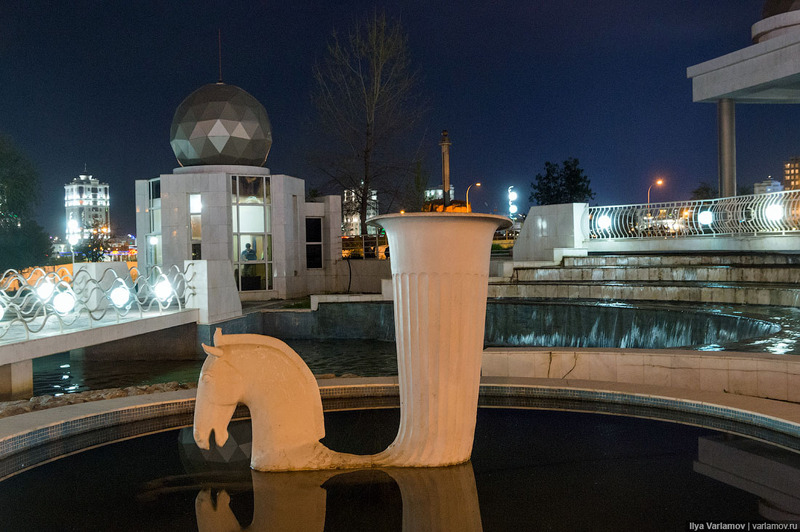 In 2013 Ashgabat made a record in the Guinness book of records as the city with the largest number of buildings decorated with white marble. 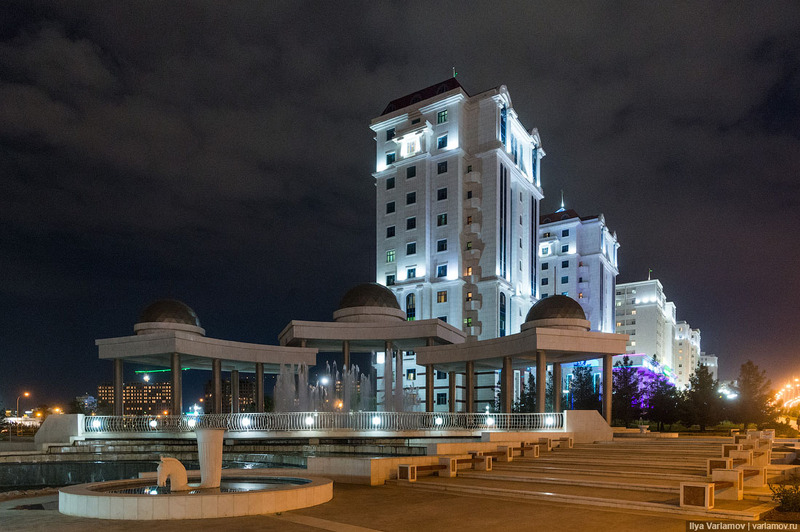 By that moment, the total surface area covered with marble in Ashgabat was 4514 million square meters. 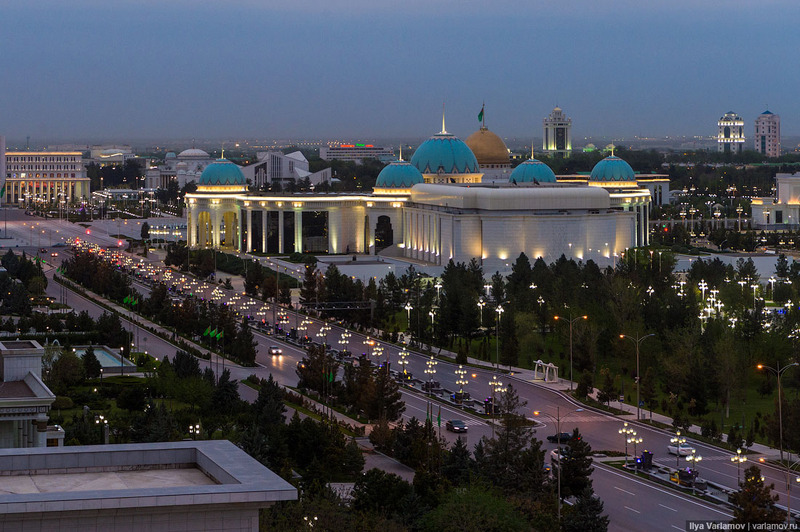 The new president and father of the Turkmen nation Berdimuhamedow continued these glorious traditions. 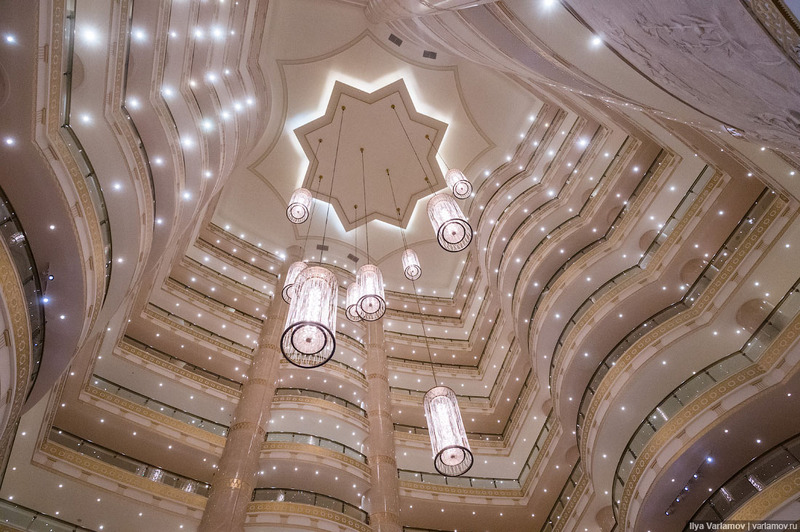 White marble not only makes the buildings look elegant, it also reflects the sunlight, thus cooling down the walls in the summer, while in the winter and in a gloomy weather it lightens your mood. 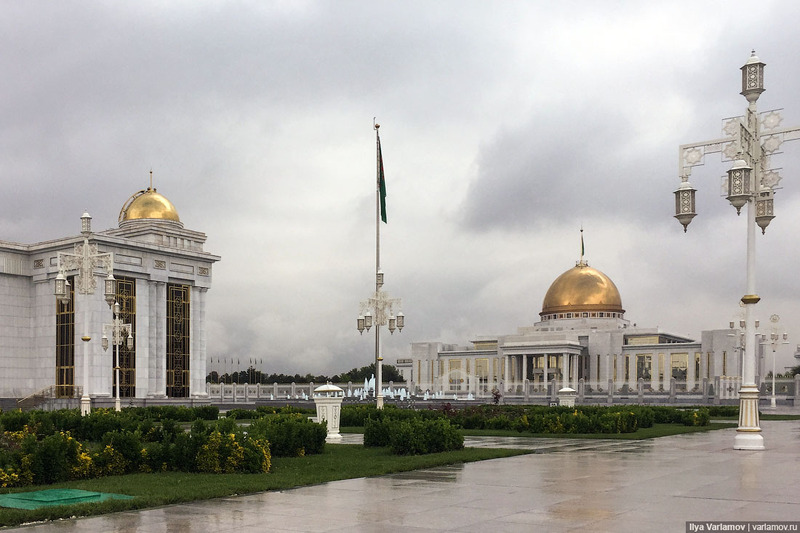 Turkmen authorities have once claimed that they bring the marble directly from Italy. However, opposition media reports that this marble is not necessarily of good quality and that in several years it becomes covered with dark spots and stains. 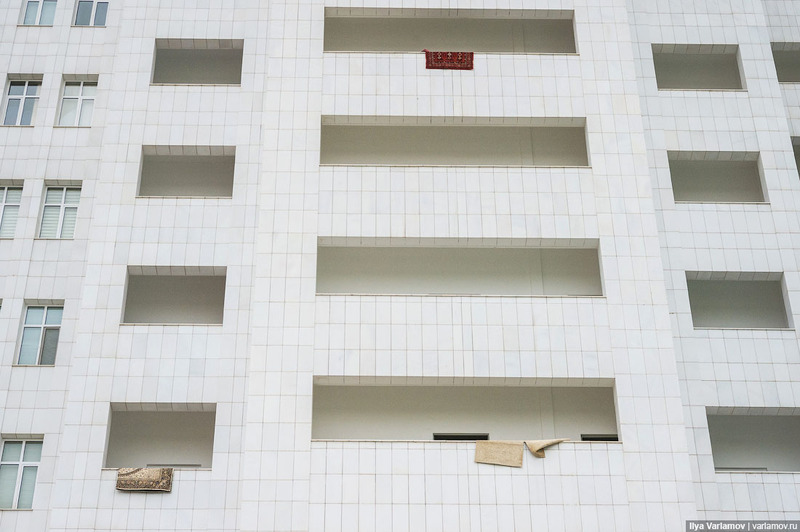 They also report that marble tiles start falling off the facades, scaring passers-by. 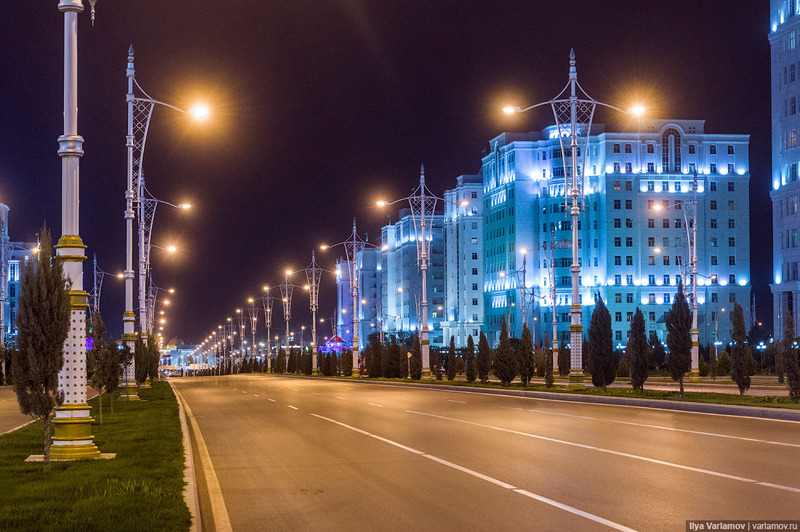 Broad avenues, huge plazas, stupendous buildings – we have already seen all of this proudly displayed in 50-s era Moscow and in other Soviet cities. 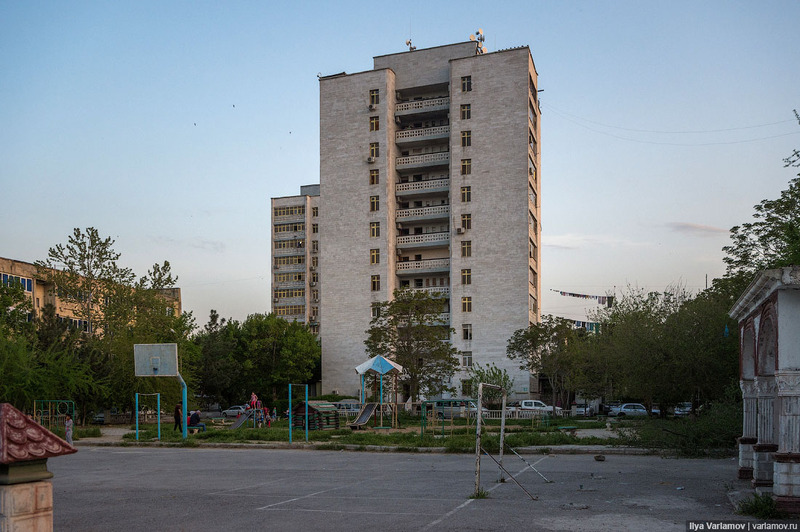 Replete with out of scale construction and vast distances that are difficult to traverse by foot, it is the architecture aligned with the regime. It suppresses people, showing the insignificance of the individual compared to the surroundings. Ideolody propaganda through art, while it seemed appropriate 70 years ago, looks strange in the modern world. In the morning I look out of my hotel window: the streets are empty! No one is out for a walk, no one is rushing to work. Not a single person out there. 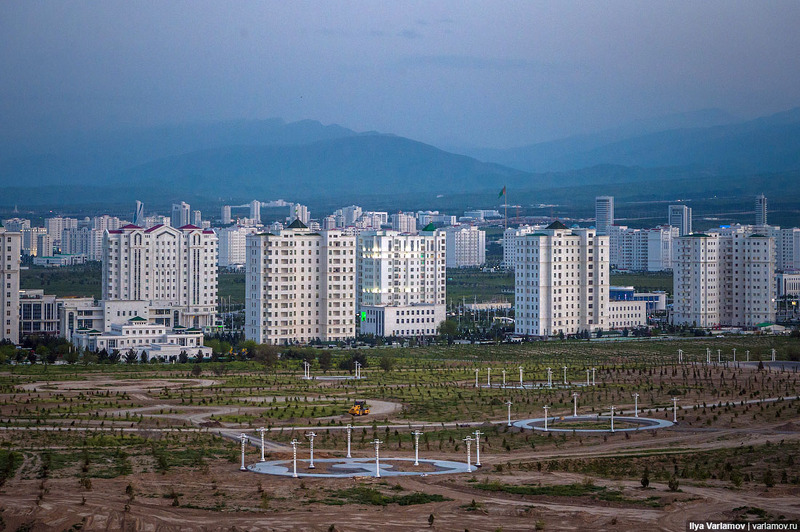 Ashgabat is being constructed at some feverish pace. 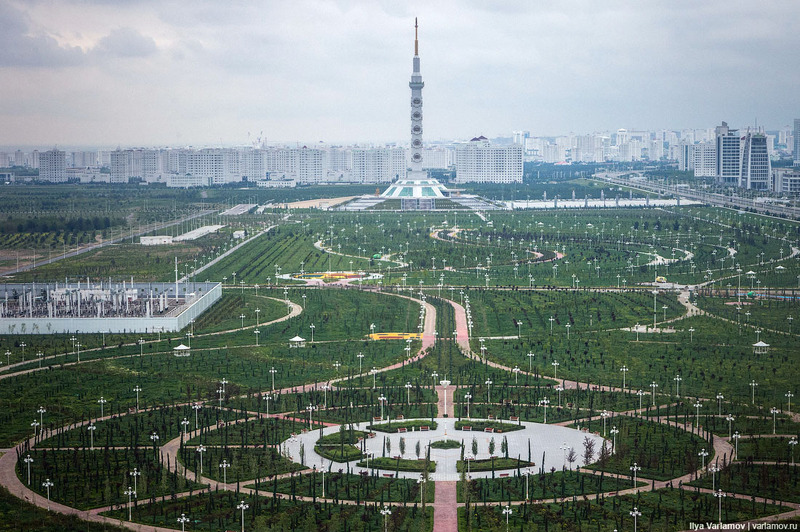 There are giant parks and plazas, buildings are far apart. Everything is empty. 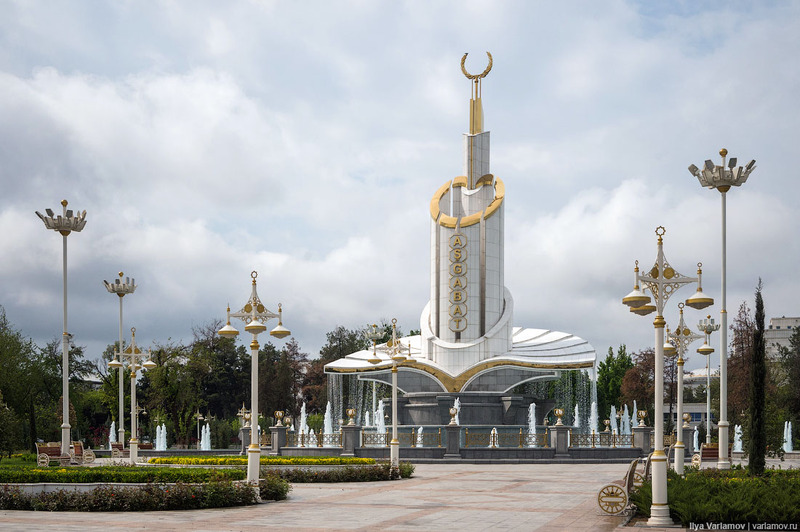 Who will play in Berdimuhamedov's Neverland Ranch? Parks and squares are empty during the day. 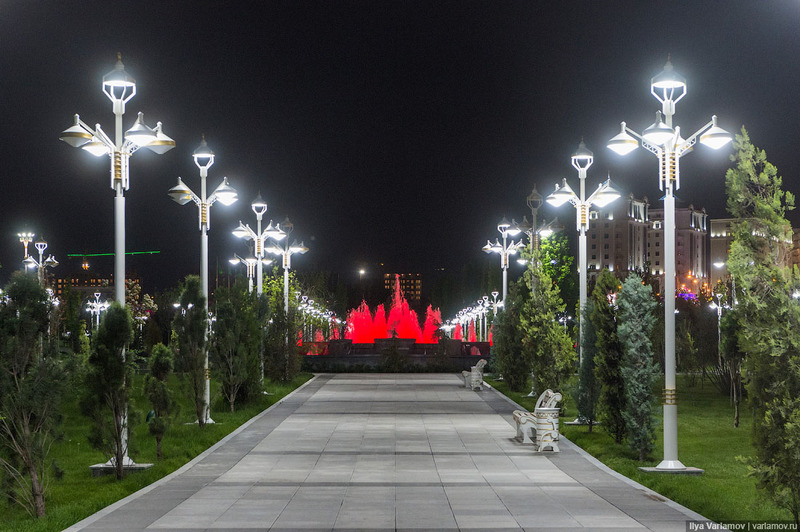 Parks and squares are empty at night. 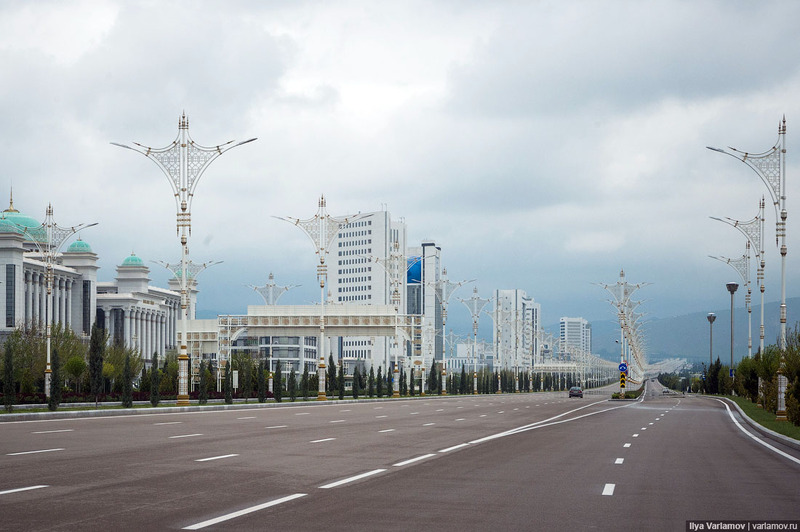 The central part of the city is completely closed to the public. 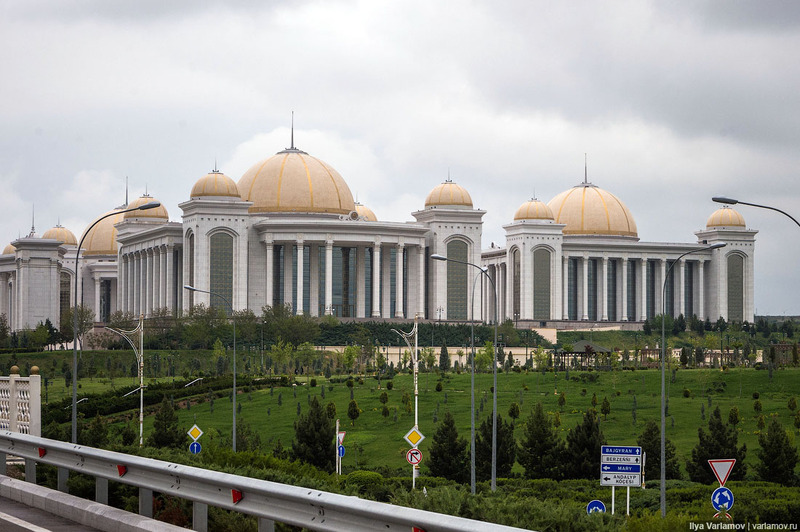 Here is the presidential gold-domed palace. It’s not permitted to go up close, taking pictures is strictly forbidden. It is here that the constructive decisions will be made. Decisions aimed at ensuring peaceful, prosperous and happy life for the citizens of our country, giving an impetus for large-scale feats towards successful implementation of our main motto “State serving the people”. Recognize the style? 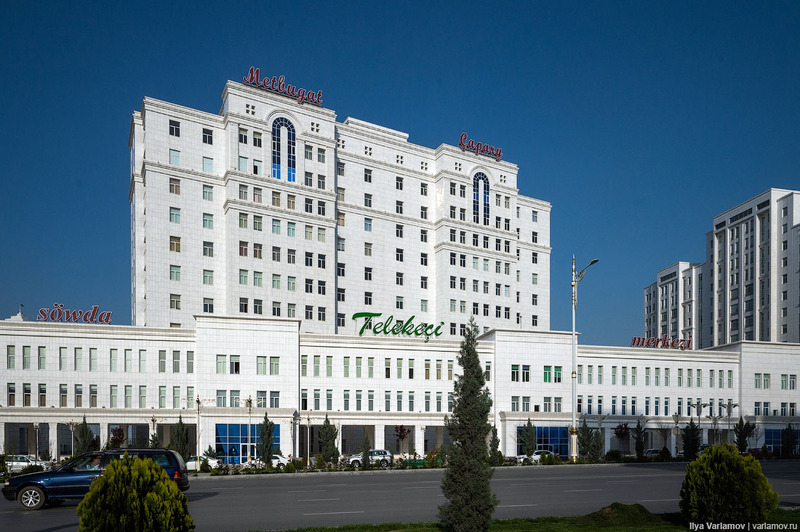 This is Stalin Imperial, rebranded by Turkmenbashi. 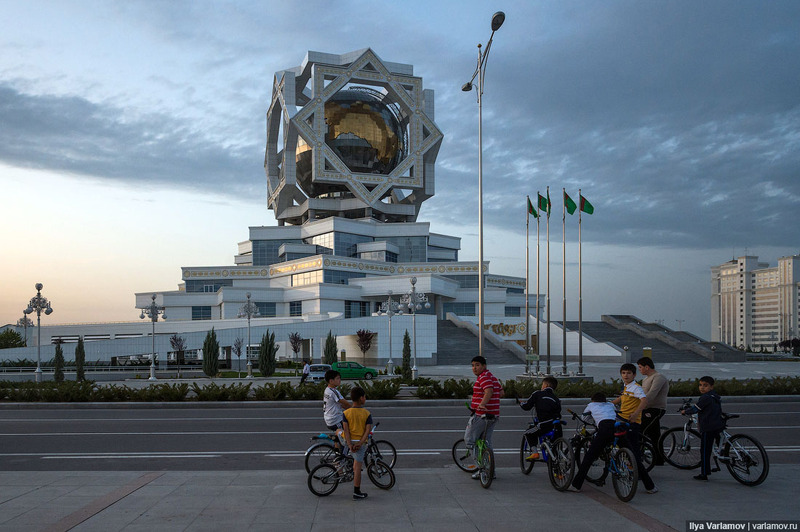 The world lived through a period of totalitarian aesthetics in the middle of the last century. 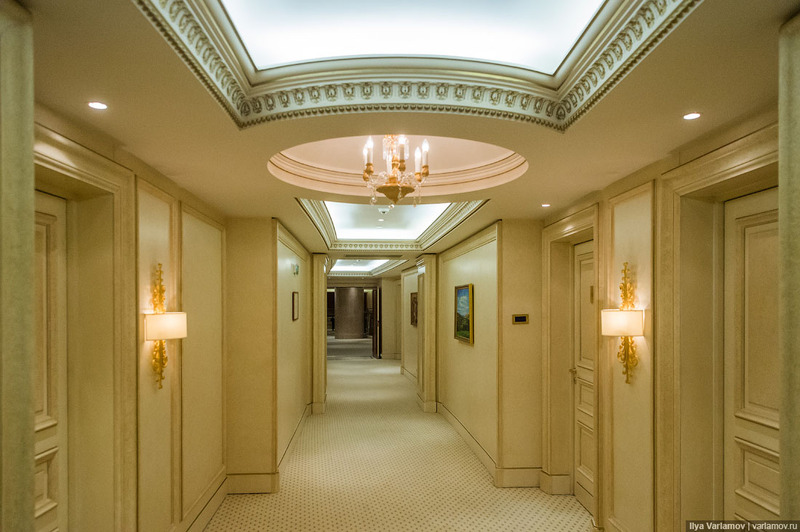 All this gigantism, turning an ordinary person into a part of some gray mass surrounded by stunning palaces. 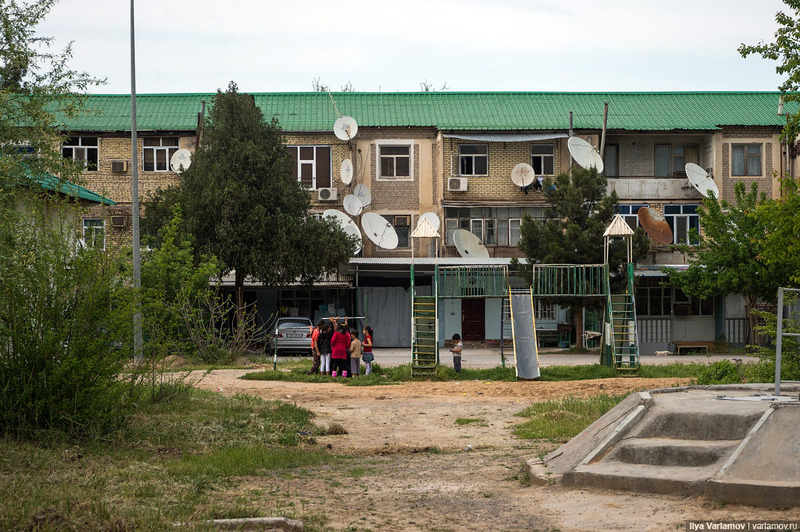 We have seen this in China, in Hitler’s Germany and in Stalin’s Moscow. 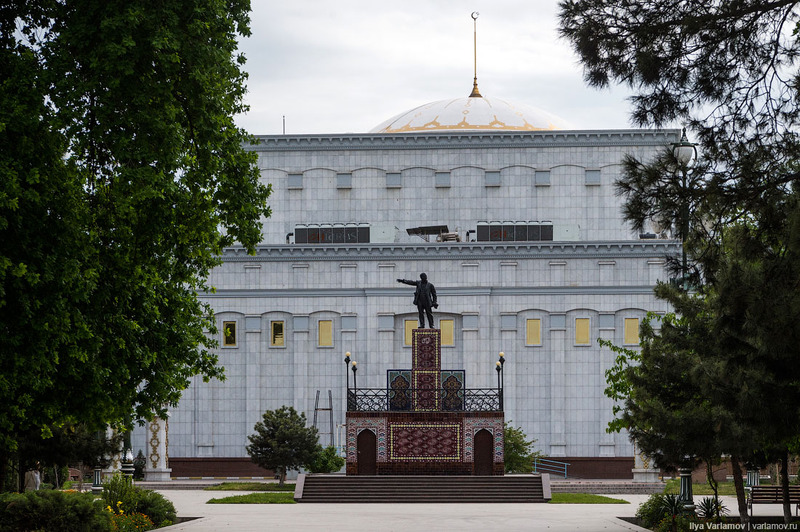 And now Turkmenbashi gets his turn. The city is made for parades, not for the people. 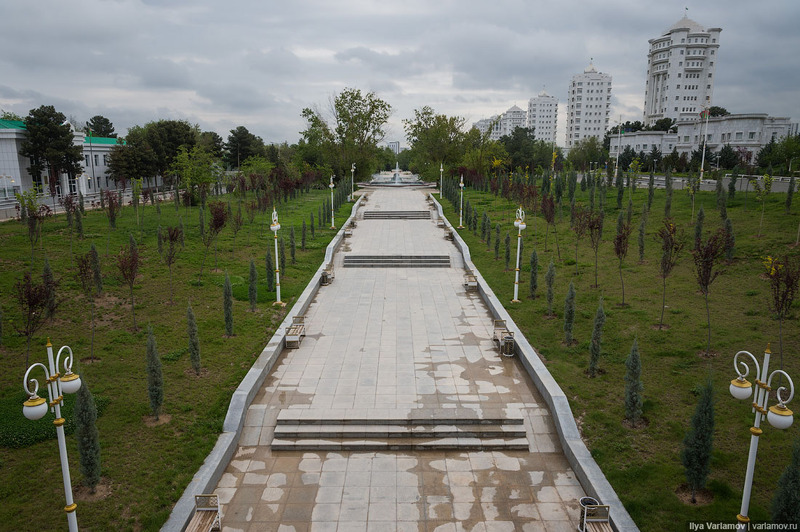 There is no one even in the center of the city, by the Ashgabat monument. 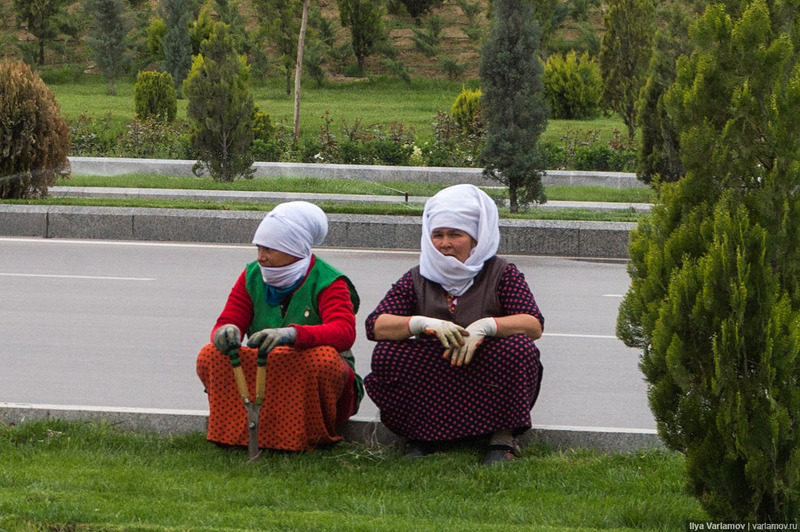 When I asked locals, I was told that everyone is at work. But no one appeared on the streets even after work. They said everyone is already home. The streets and squares stay empty even on weekends. 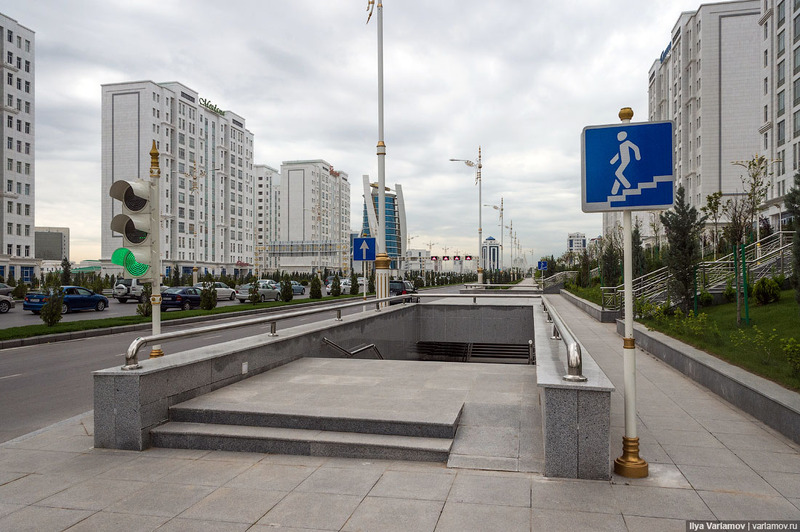 The city center may be entered by car only. A mere human shall not cast his miserable shadow upon great palaces. Plaza by the president’s palace. This is not a restricted area, more like the Red Square but no one is here. No one is taking pictures, no one is selling souvenirs. Having spotted me, the soldiers gestured for me to get out quick. But why? “You can’t walk through here!” a livid policeman in green uniform yells out. This cop could not understand that someone may want to take a walk through the streets. 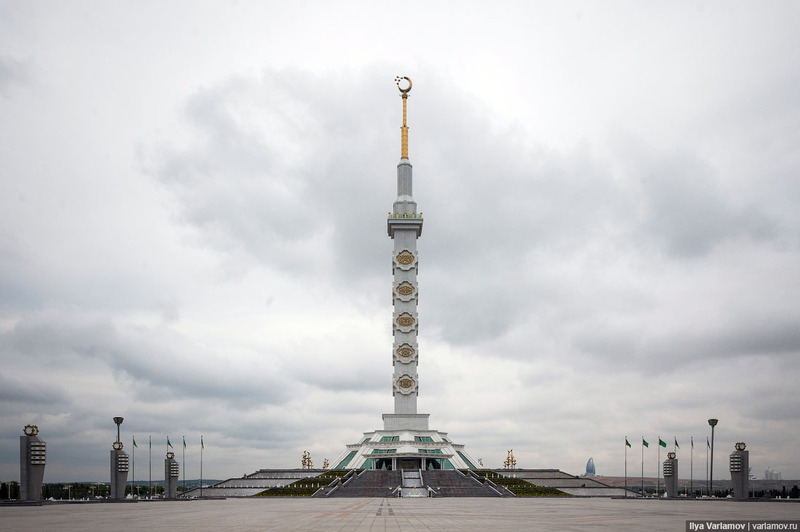 Just lonely golden statues, rare street sweepers and cops and soldiers who make sure no one is loitering. All buildings have similar signs. Usually it just says “store” or “coffee house”, or “business center”. Individualism is not welcomed. Four colors are available for all the signage – red, green, yellow and blue. There are only a few fonts available for the entire city. It’s strict around here. Everything exactly the same everywhere. 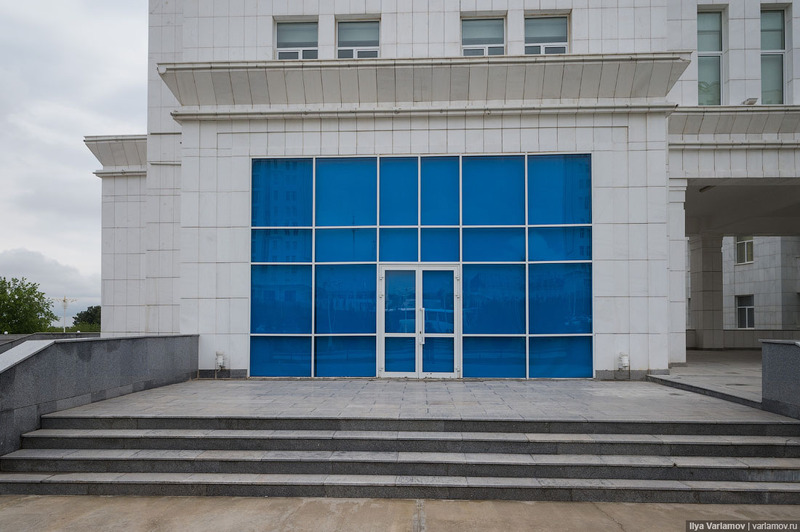 No show-case windows, no digression from strict rules allowed. Just mirrored glass and nothing behind. One street was permitted to display known brand logos. Seems it’s made to create an appearance of life in the city of the dead. 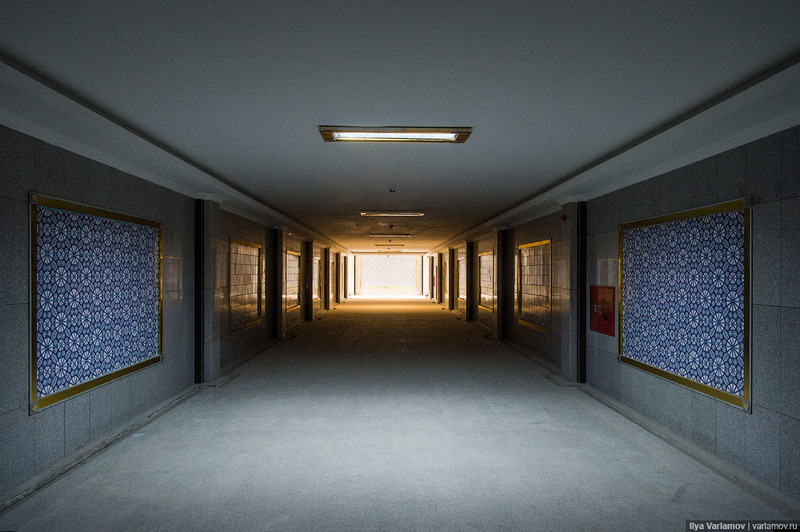 An underground street crossing sing as a symbol of a totalitarian regime. Rare pedestrians cross empty streets by the route above. 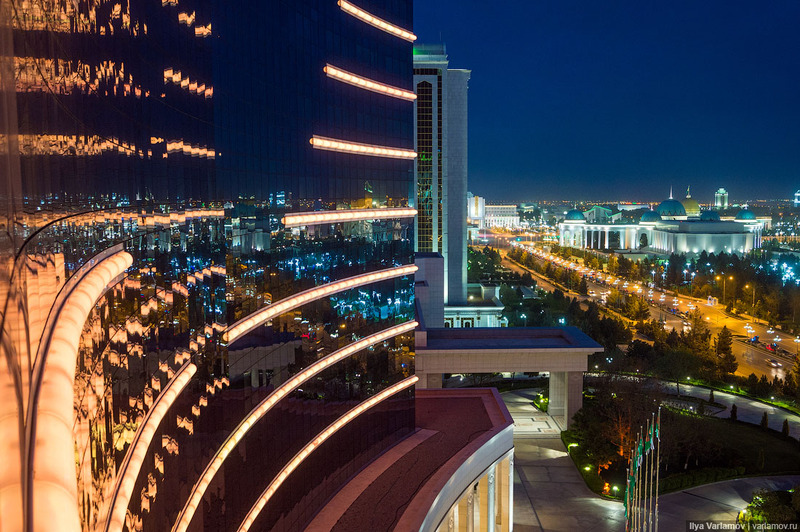 A city serves as a huge set for a happy life. No one is parking, no one is shopping. Taking a closer look reveals something sinister and depressing: all stores and coffee shops signs are fake. Nothing is there. Sometimes windows are lit from inside, but it’s just for looks. Sometimes one can encounter an oasis of life. Shops are sandwiched between the buildings. Neon signs depict the shop type. Here is a furniture store in the foreground. And this is a coffee house. Most likely there is no coffee house there, but that doesn’t matter. And this is a would-be store. 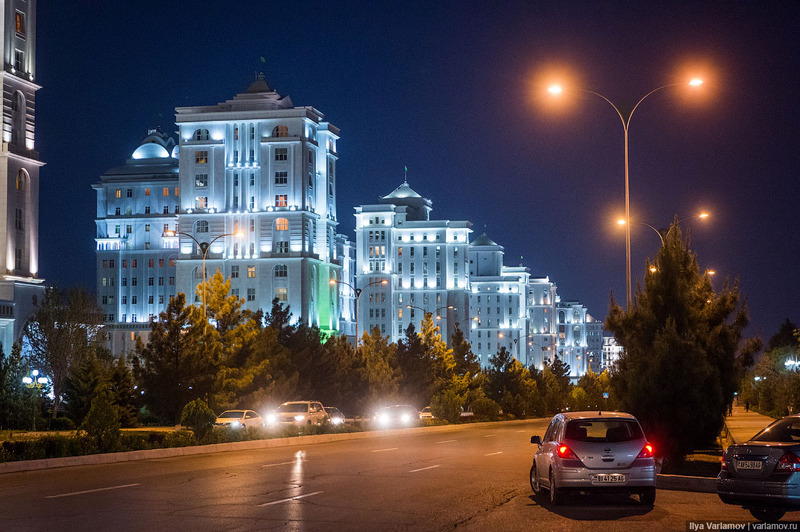 A warm Turkmenistan evening... 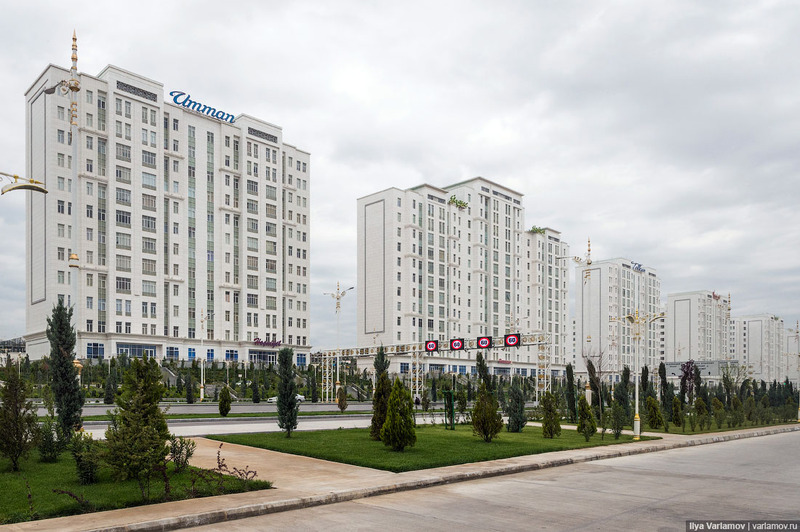 Here is a residential district but the streets are empty. 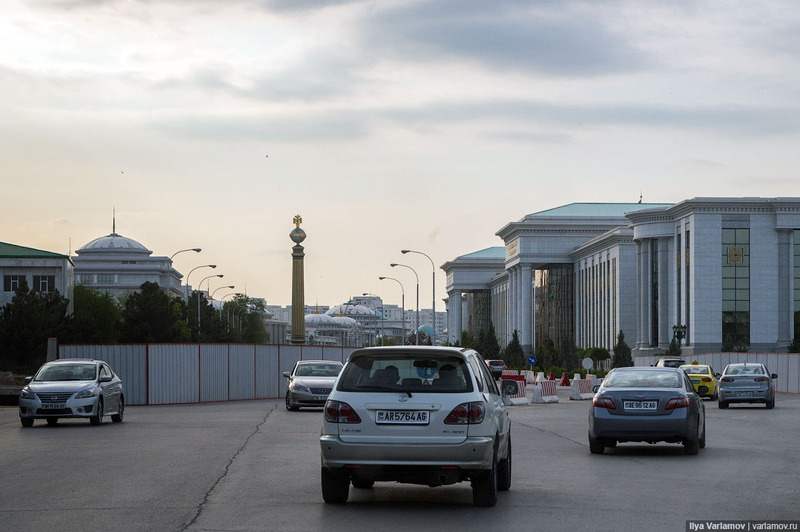 These houses are considered elite, built for officials and authorities. 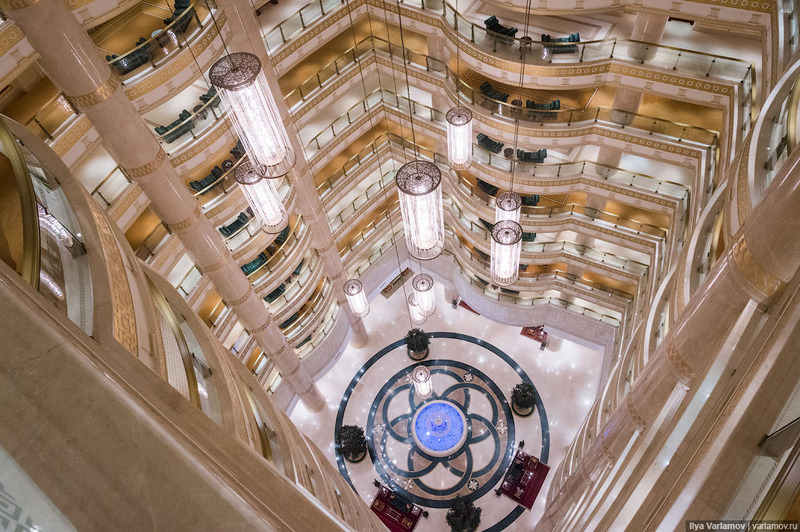 There have high ceilings, underground parking and centralized air-conditioning. People dry rugs out back. The yard is empty, just a few parked cars and that’s it. 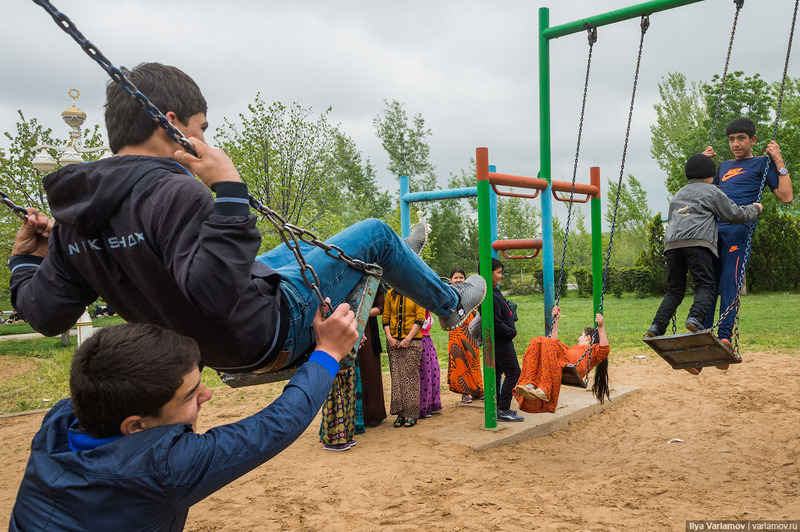 No kids on the playground. 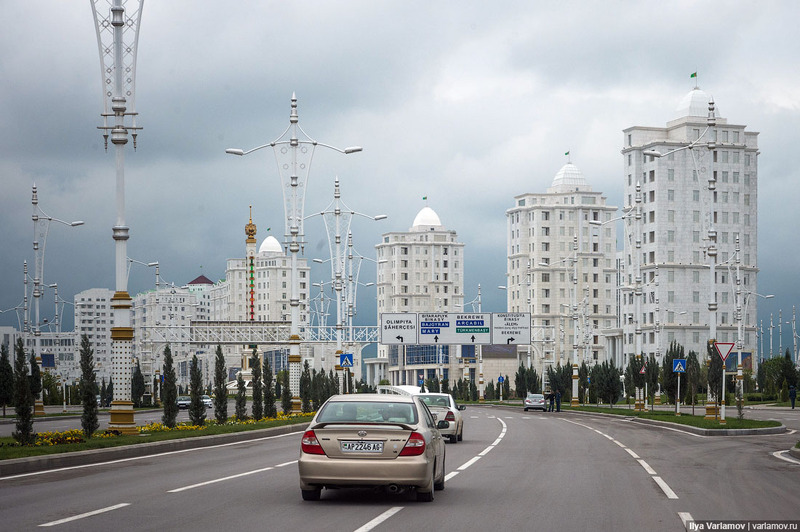 New Ashgabat looks like this. And like this. This is not a random passerby, this is a cop on patrol. A postcard city. 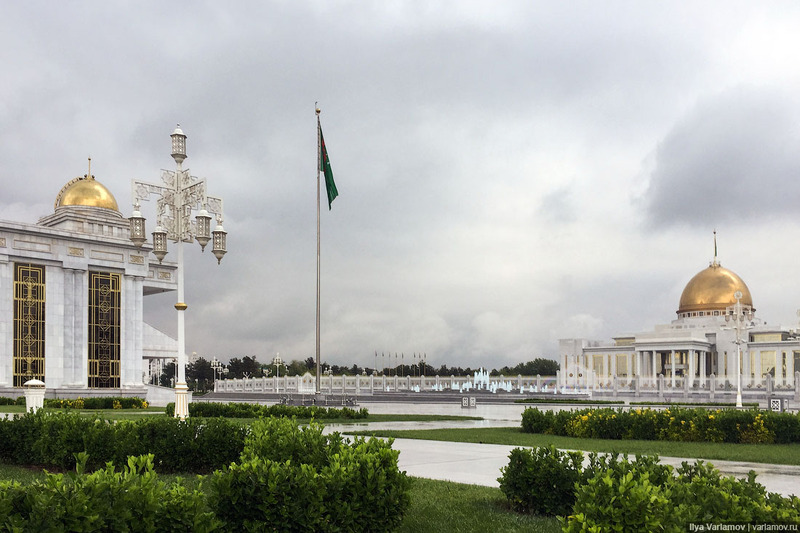 A city for parades, and demonstrations of the power and prosperity of Turkmenistan. A city for everything but the people. 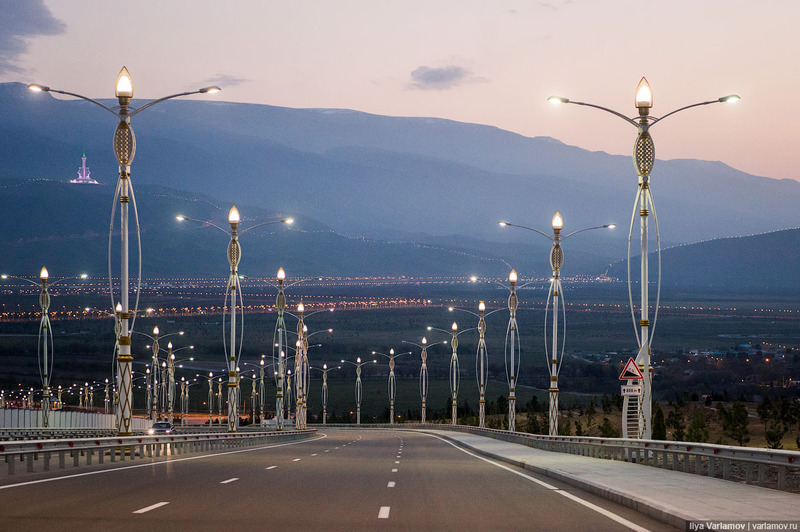 Note the streetlights. They differ from street to street. By looking at the streetlight you can fihure out where you are in the city. 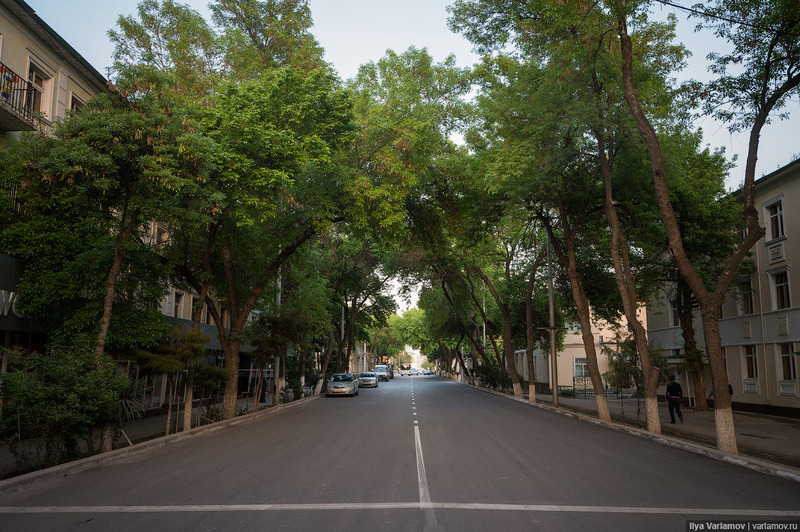 The streets are deserted during the day. They are deserted in the evening as well. Three lines in both directions. This is a hotel approach. A car passes here once in 30 minutes. 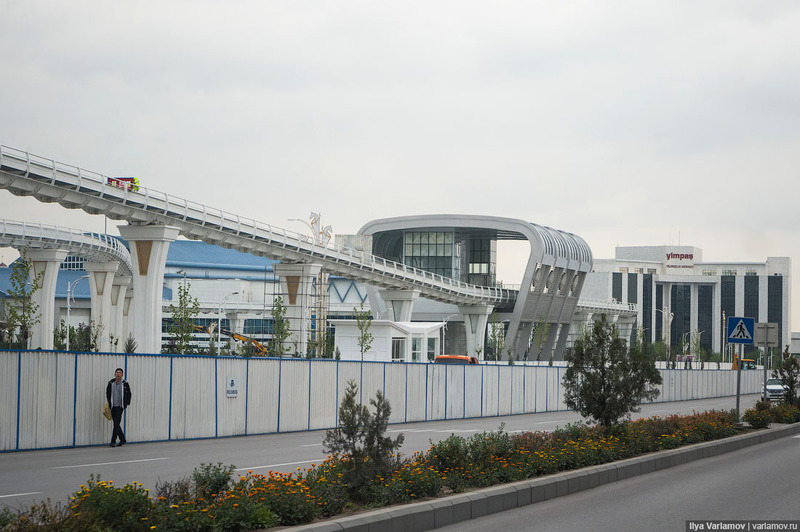 Ashgabat is constructing a monorail - the most useless and inefficient mode of public transportation. A very large park. Try to count the number of people there. 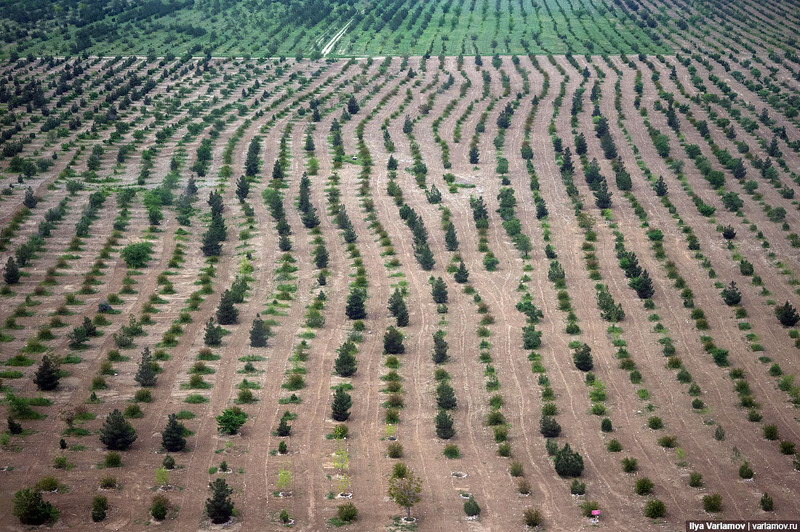 There will be a forest here. 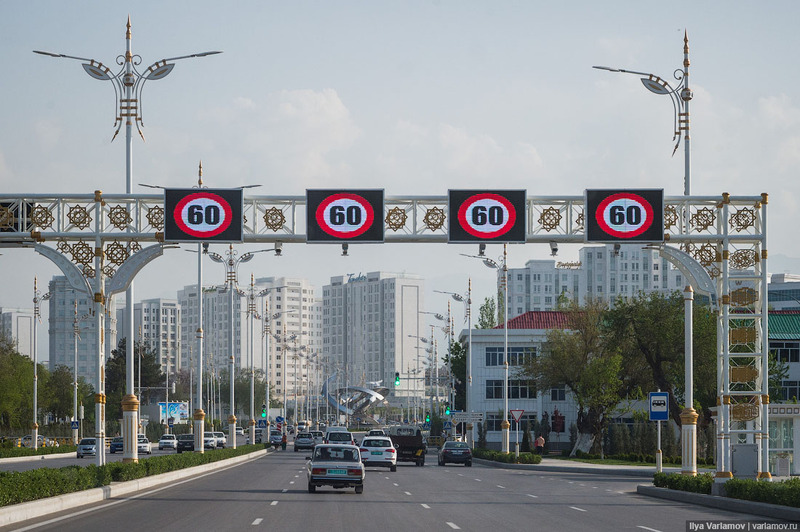 The latest Ashgabat trend: signs are replaced with screens. 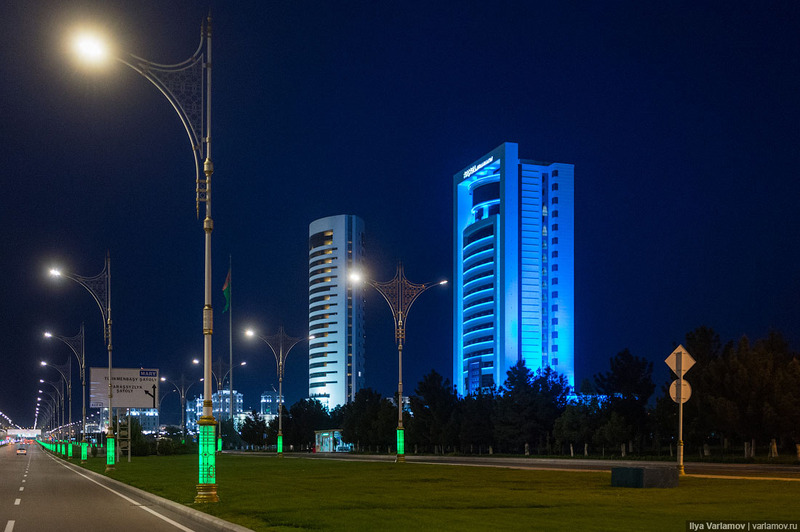 Ashgabat consists of two sections, the new and the old city. 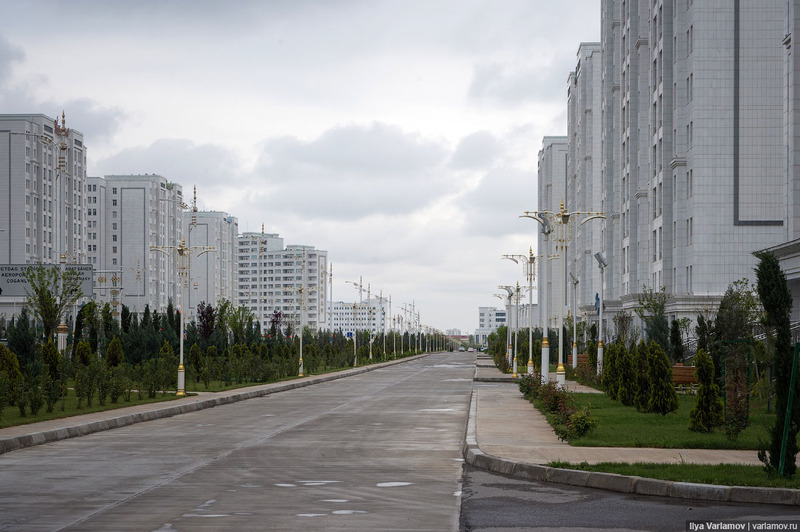 That is, an empty white-marbled licked-clean movie-set with no people and old soviet construction with living yards and busy streets. 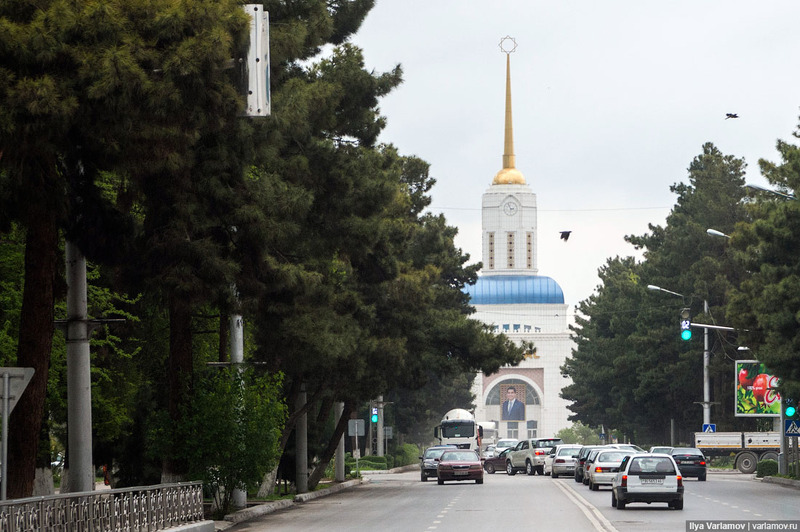 The segmentation stems from a tragedy in Ashgabat’s past. On October 6, 1948 the city experienced one of the most destructive earthquakes in history. About 90-98% of buildings were destroyed. According to different estimates, half to two thirds of the population died. 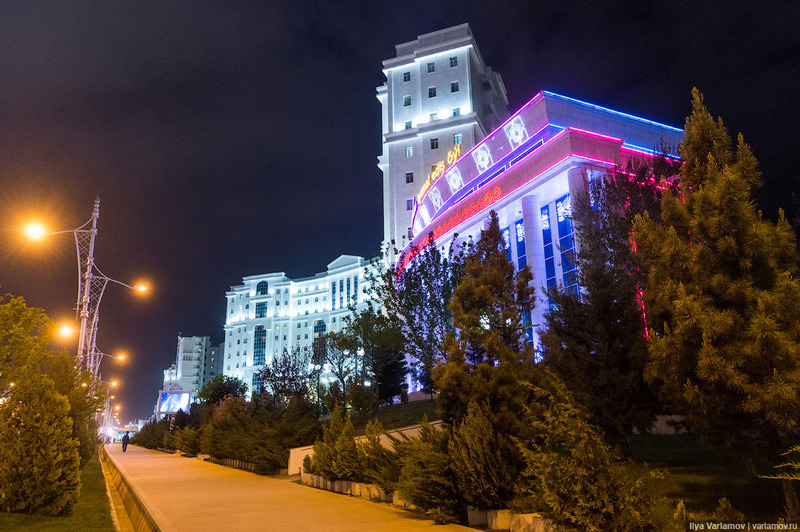 Following the earthquake the city was practically built anew. 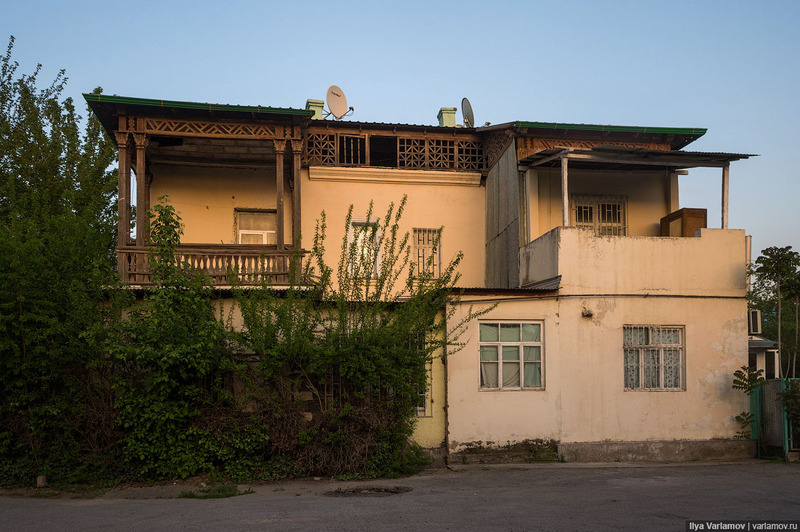 Today what remains of this old construction constitute the old city, steadily disappearing, replaced by the parade-marbled Ashgabat. 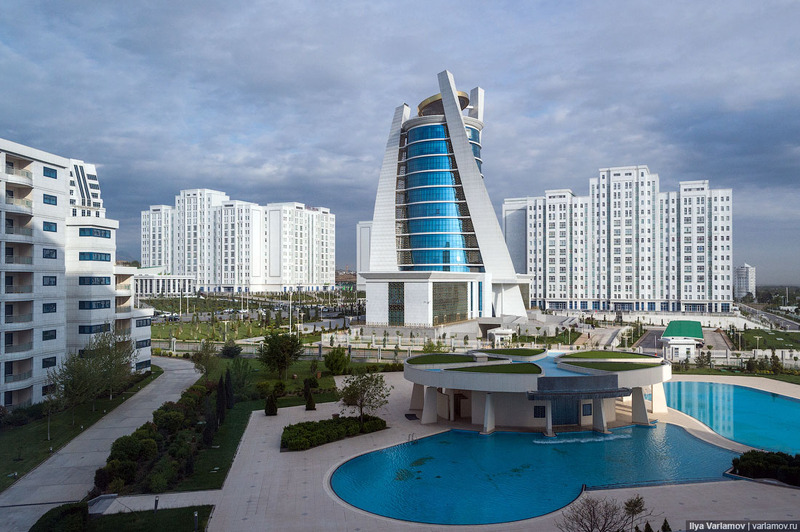 The Ashgabat city center is unbelievably pleasant. 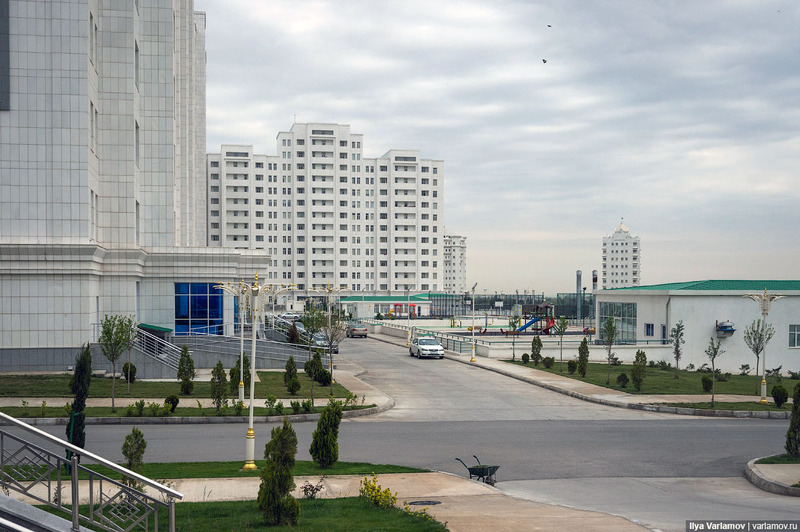 A very clean, green post-soviet city. Many people and cars here, and very few decorative props. 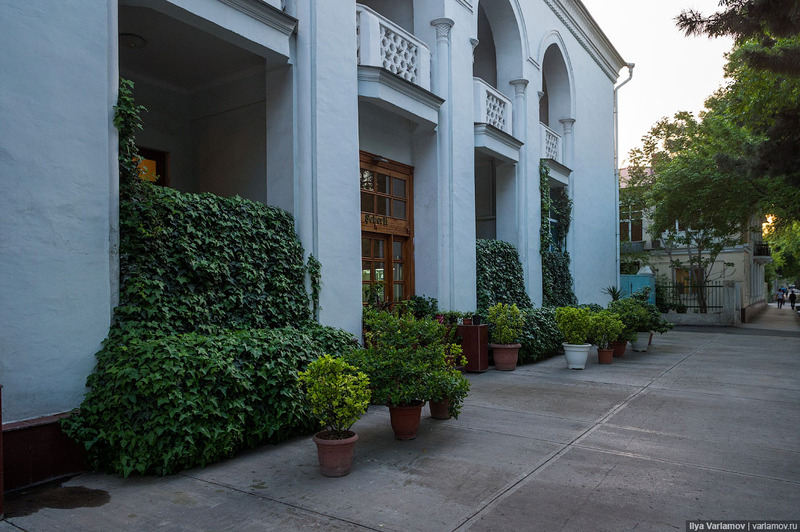 All buildings are in good condition. 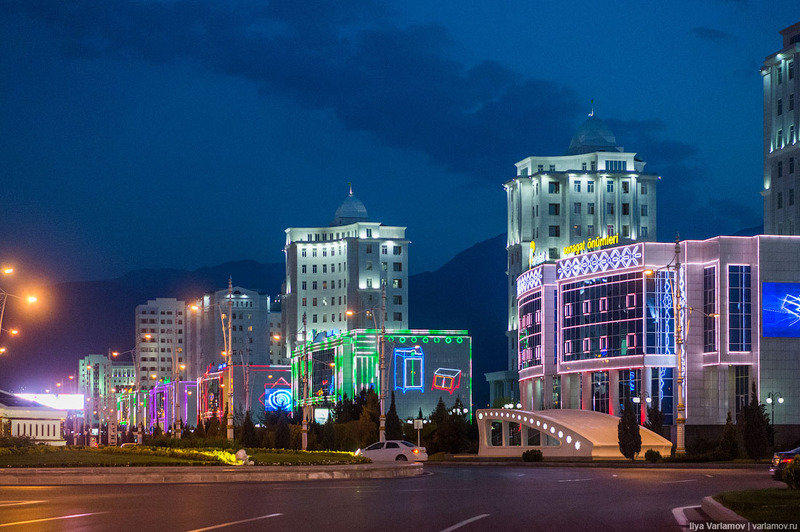 Unfortunately, all of this will be demolished because the old city conflicts with the concept of white-marbled Ashgabat. Meanwhile, it stays like this. Check out these houses. Very nice. People grab the adjacent land and create personal yards. 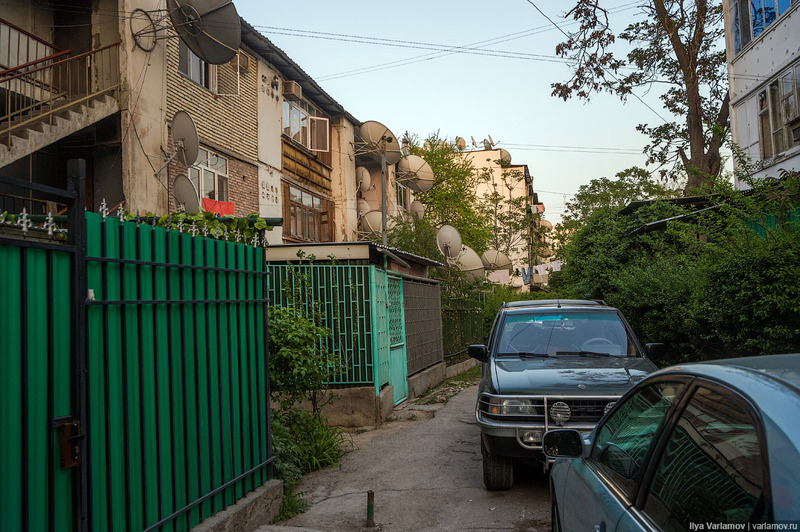 All of Ashgabat is covered with giant satellite dishes. 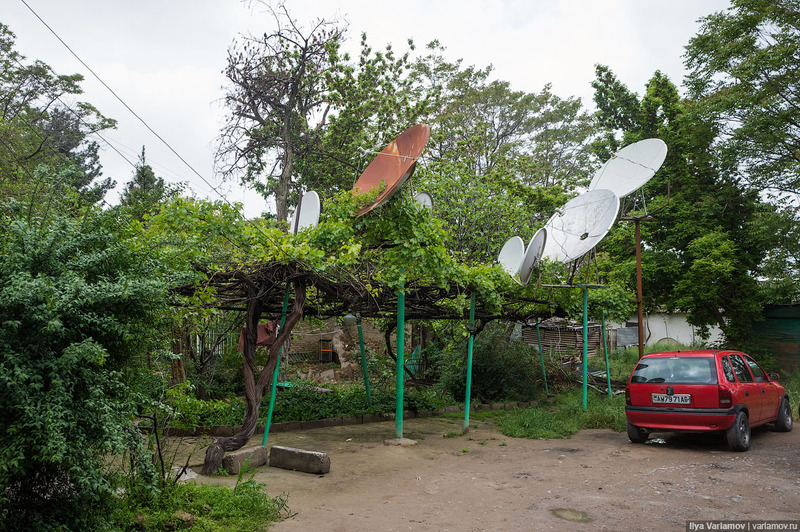 There are satellite dishes even in remote villages. 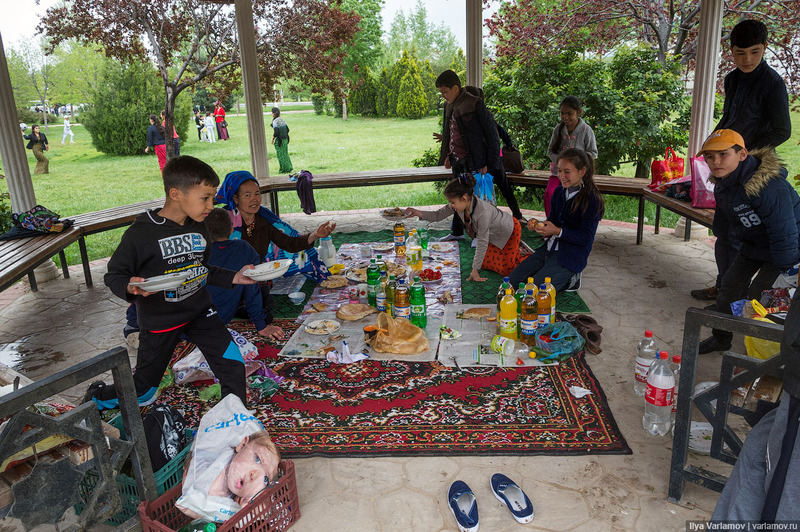 They are cheap, so every resident feels a need for a personal dish instead of sharing one with several families. 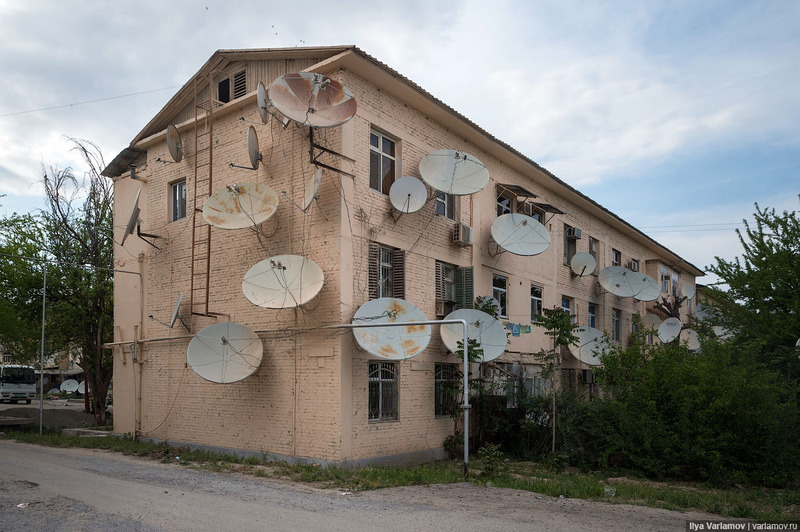 The satellite TV boom hit Turkmenistan in the late nineties. For many, this remains the only “window to the world”. There is no foreign press, internet is expensive and access to many media resources is blocked or controlled by security forces. 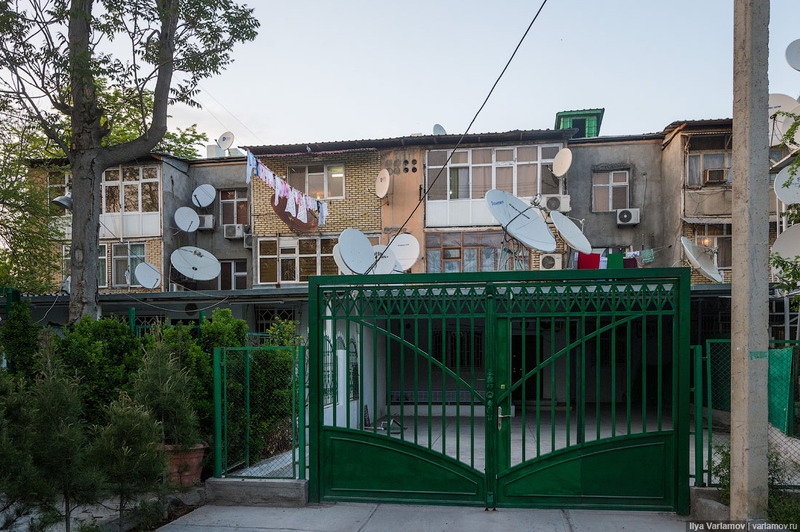 The most watched are channels are Russian, Turkish and European. The most popular Russian channel is TNT. 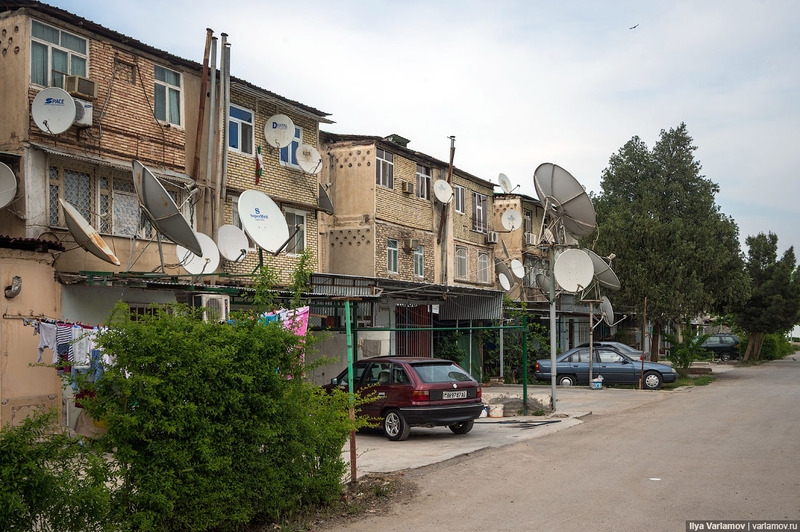 A year ago Ashgabat authorities required satellite dishes installed in multi-story buildings to be removed. 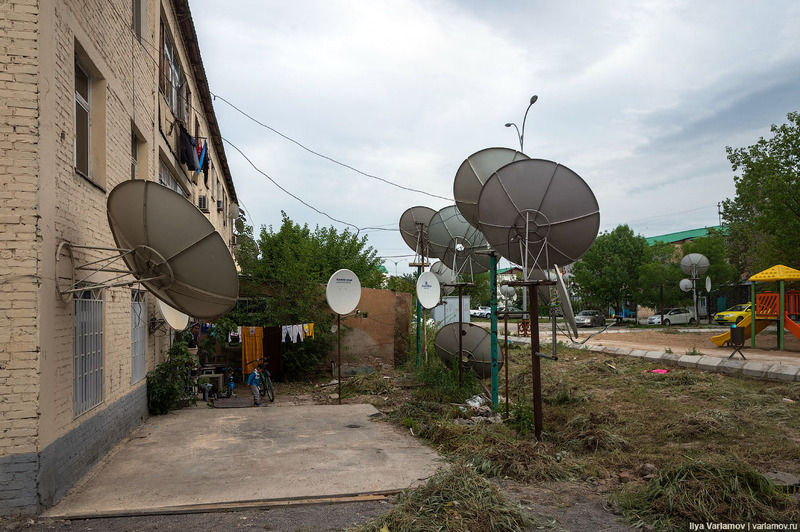 People were offered cable or official state-controlled satellite dishes. 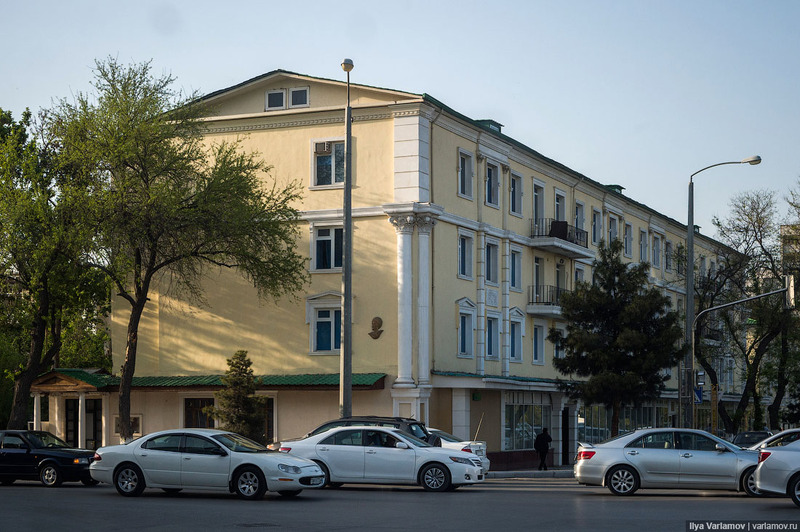 The Human Rights Watch immediately raised concerns that the authorities were seeking to completely isolate the country from independent information sources. 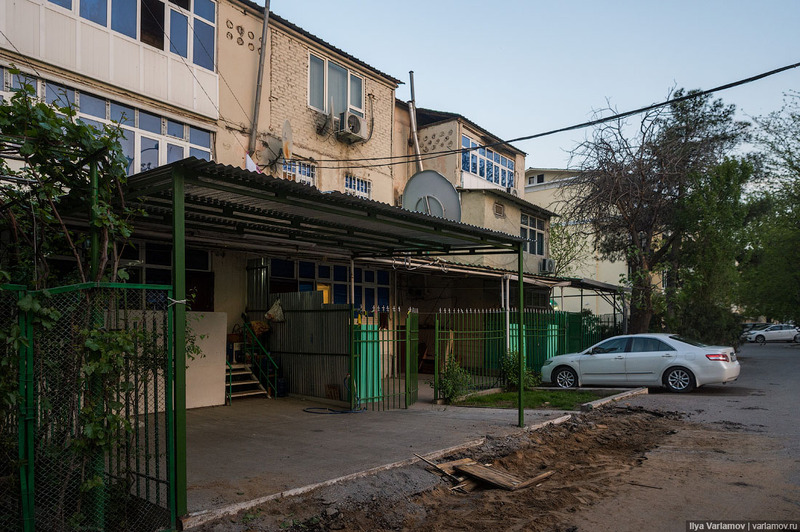 According to this organization, when some residents refused to remove their dishes, these dishes would magically be destroyed when the owners were away. I have not noticed any demolished dishes. However, add-on sheds are being removed. 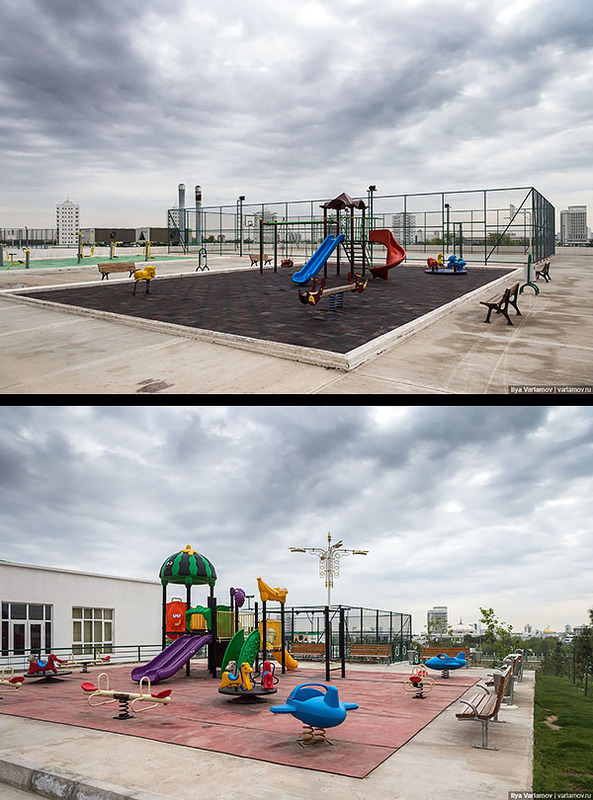 It used to be that you could build anything in the back yard, now people can grab no more than four meters. Ground floor residents usually construct a separate entry to their apartment, garage and summer kitchen. 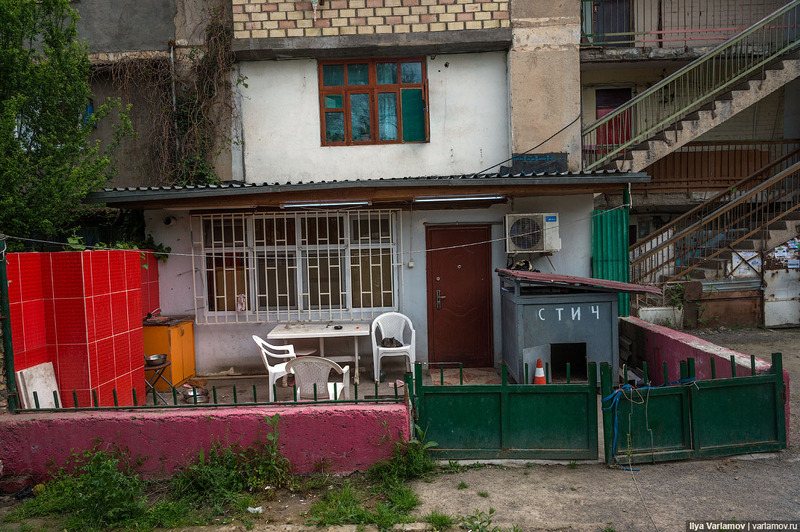 They try not to be conspicuous about it, or the neighbors will snitch and everything will be demolished. 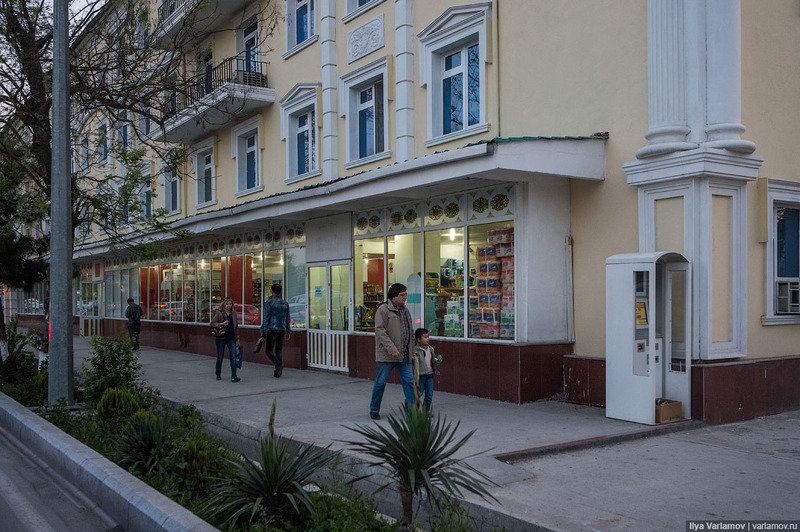 Ashgabat has fairly cheap power, so even simple shops or houses have air-conditioning units. It is terribly hot here in the summer, and you can’t live without air-conditioning. 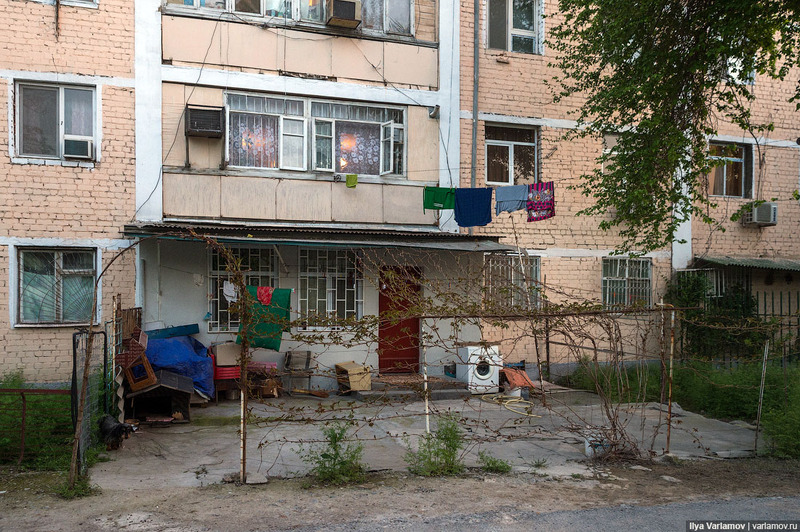 The authorities rail against units hanging from street-facing facades. 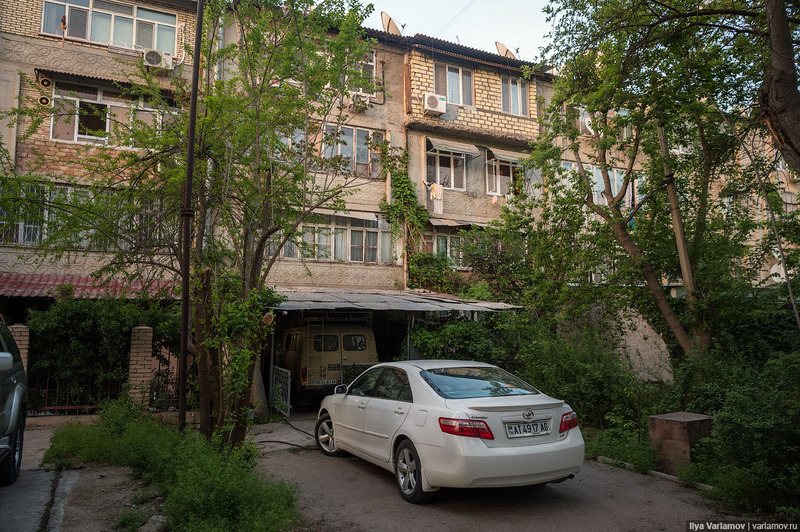 In 2014 municipal services started to take A/C units off the walls of residential houses “to improve the view of the city”. Then ashgabatians came out to the streets and protested. 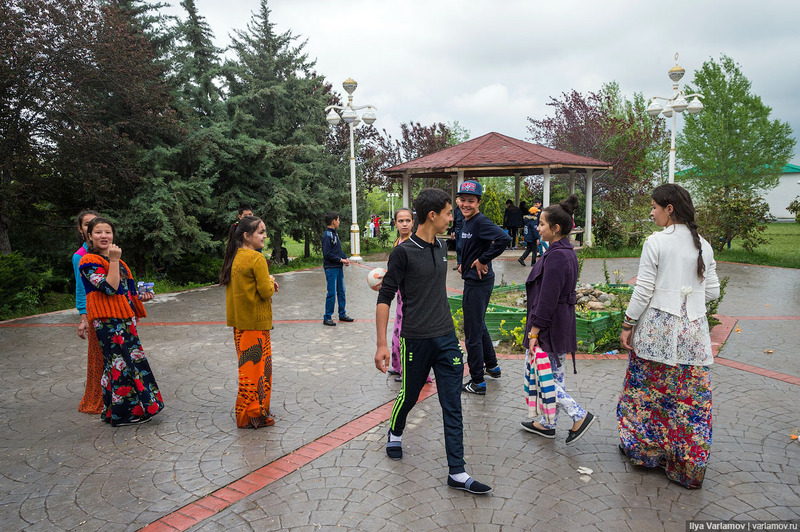 About eighty residents came out, men and women equally and about twenty policemen, also about the same number of military and security personnel. There were no serious clashes. 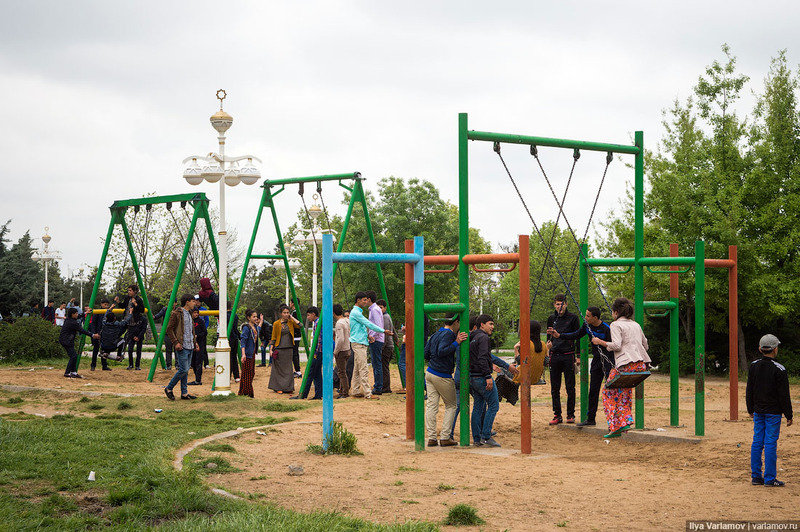 Authorities realized that this could get serious if the conflict continues and nearby residents join in. They calmed the people down by promising not to demand the removal of units, and retreated along with cops and soldiers. Tuhbatullin says the authorities have been waging war against A/C units since 2012. 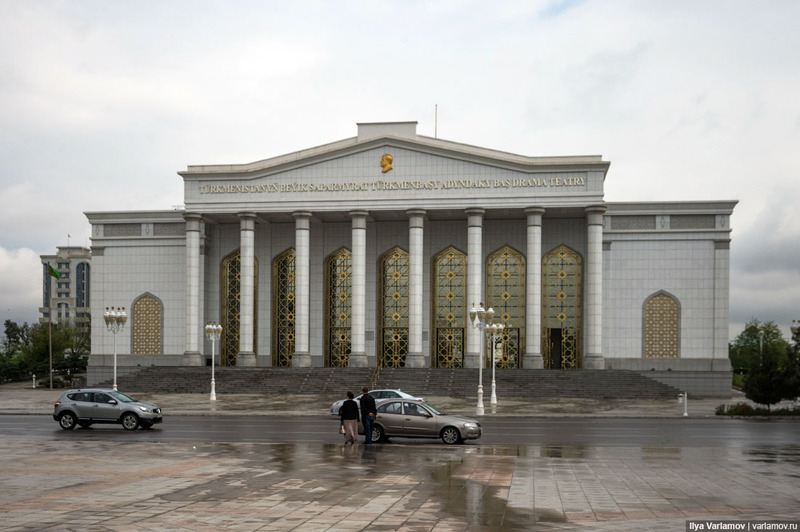 Reminded of the harsh climate in Turkmenistan, he calls this an affront to the people. There are different stories why authorities behave this way. According to one, they seek uniform appearance for the streets, to another, they are afraid that a bomb may be hidden under one such unit. There was an incident when one such unit inexplicably fell down during the passing of the presidential cortege. 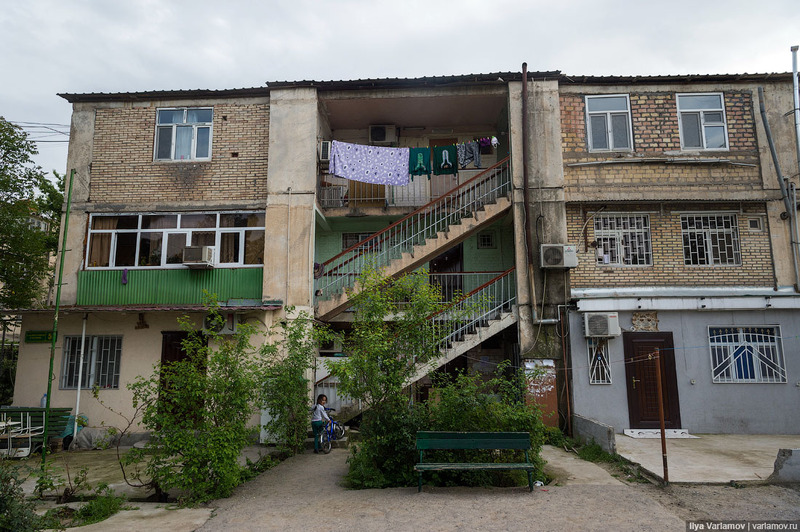 In addition to A/C units, the authorities forbid Turkmen from drying their laundry off the balconies, storing junk there and opening windows during official events. 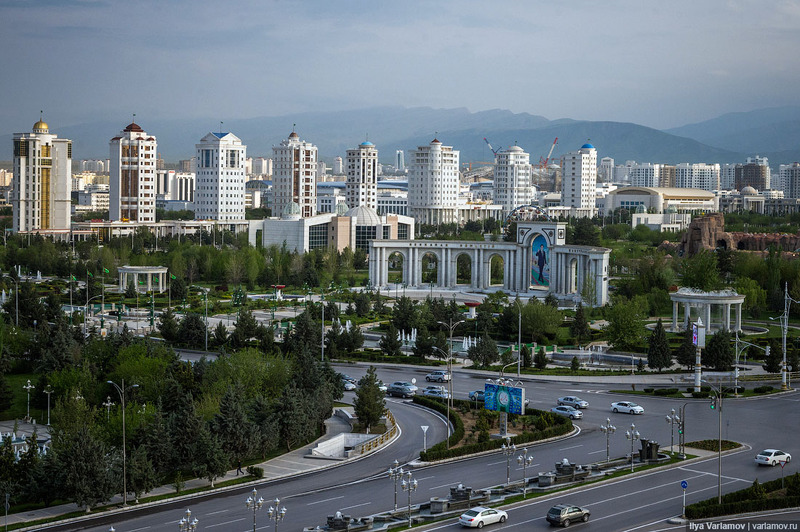 So “free Ashgabat” may only be seen from the back yard. Seems they took up a bit too much land. Several high-rises in the center. Highschoolers have green dresses, college students wear red. 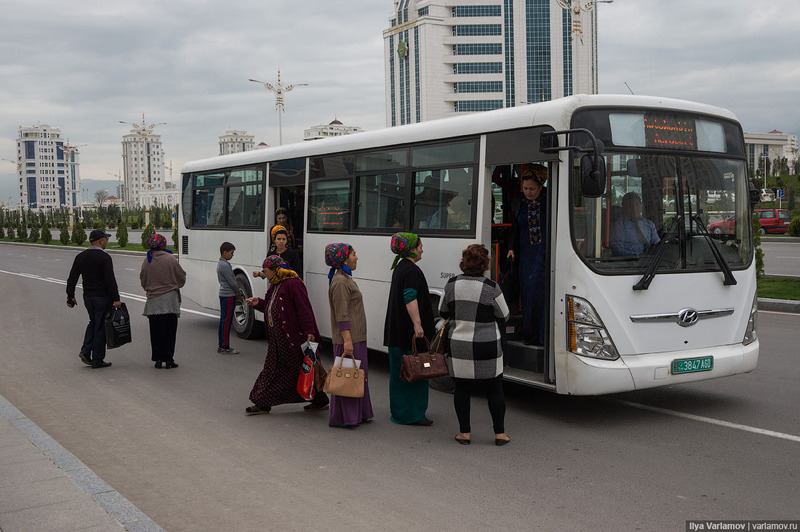 Tourists may not come to Turkmenistan and live just anywhere. 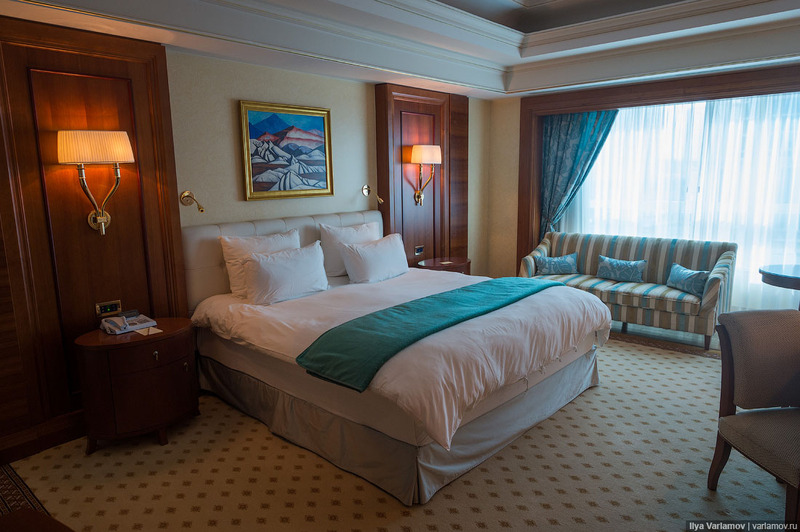 You must stay in one of the hotels for foreigners, of which they are not many. They are all good and expensive; a foreigner should be impressed. 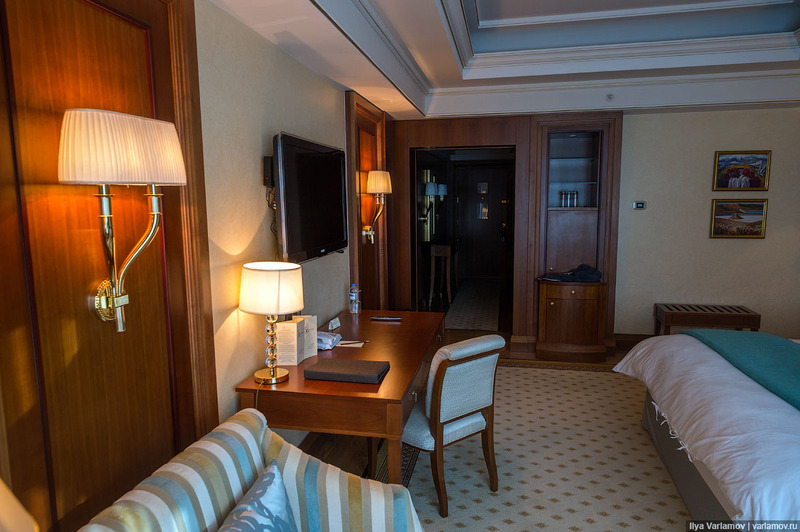 The best hotel in the city is “Sofitel Oguzkent”. 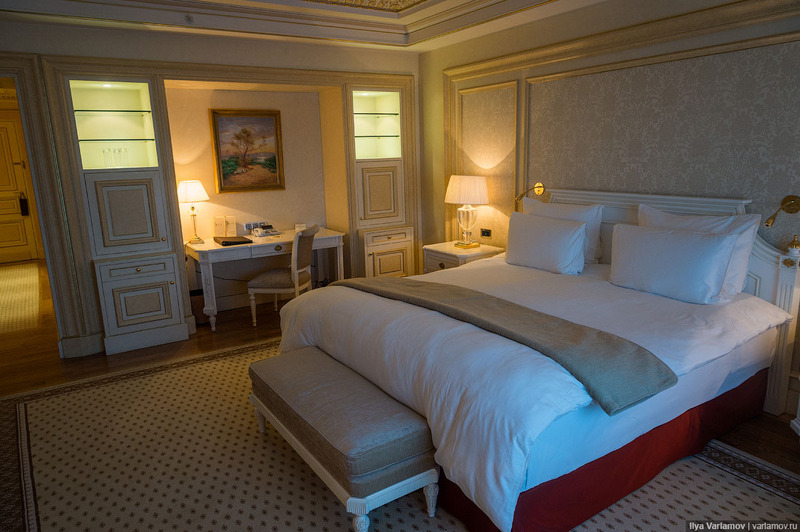 Rooms are from 300 dollars per night. 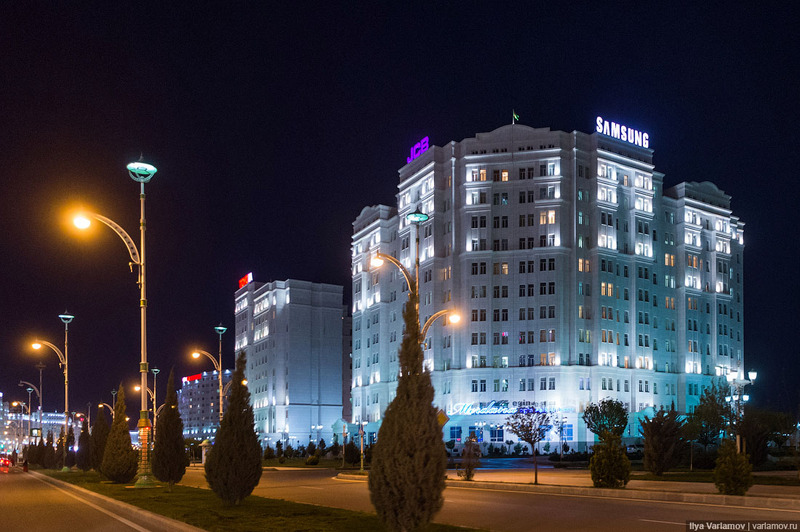 The hotel is nothing special. But if I start listing flaws you would say I am picky. 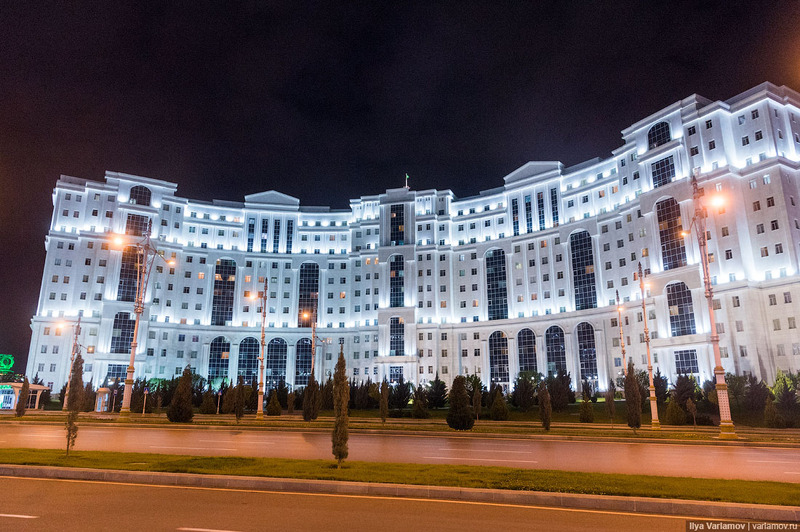 The best this hotel has to offer is a view on the presidential palace, which may not be filmed. But I can do it from the window, right? :-). I did have to change the room. 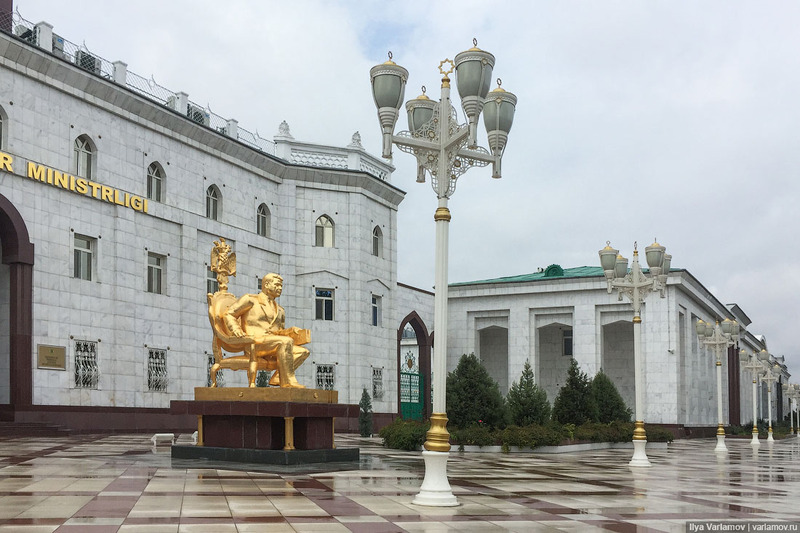 Also Ashgabat has the greatest Lenin monument in the world. I cannot confidently say it should be moved to a museum. 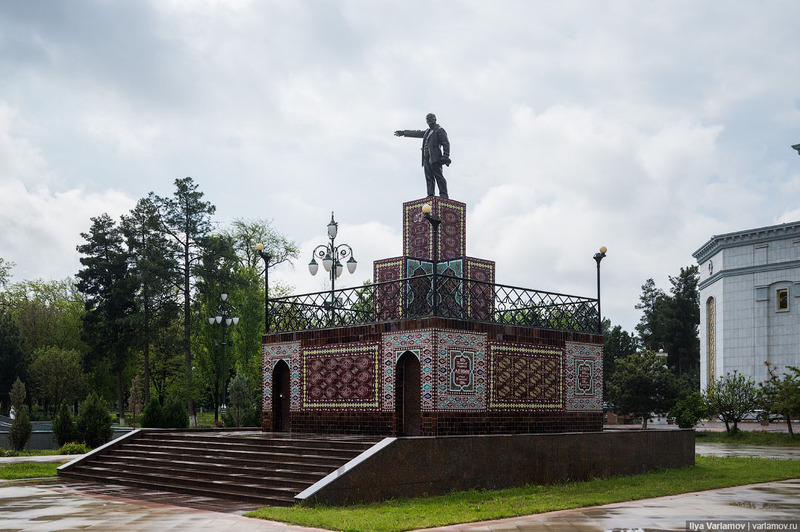 Construction of the monument began on January 27, 1924, the day of Lenin’s funeral. It was opened November 7, 1927. Since that time nothing troubled Grandfather Lenin, even the 1948 earthquake did not damage it. 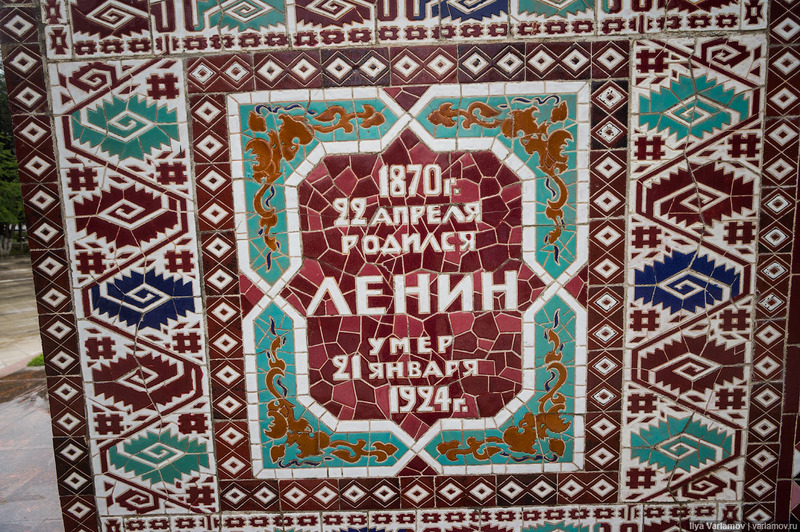 The base is decorated with majolica, similar to a Turkmen rug. I think this is what saved it even in the age of golden statues. The statue itself is made from melted down artillery pieces. 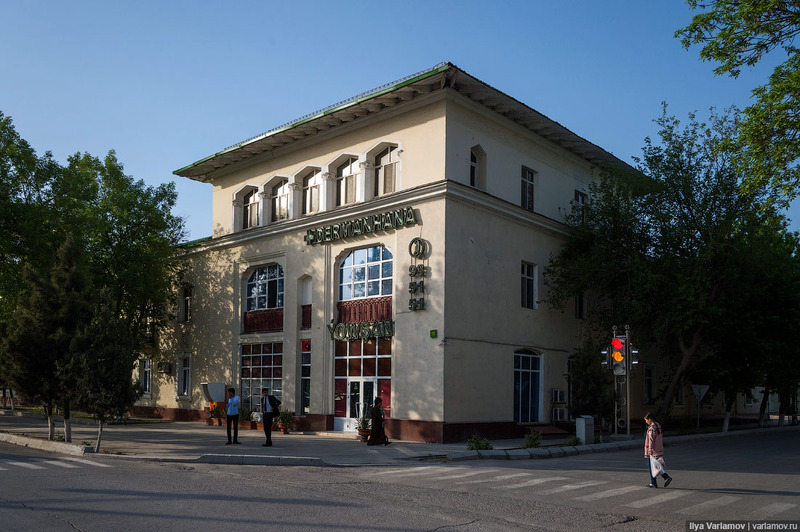 Back in soviet times the base held, you guessed it, a Lenin museum. 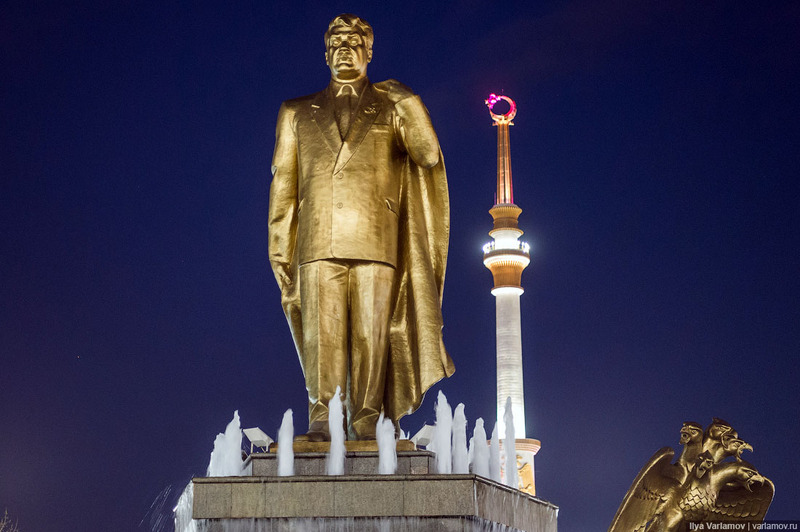 They say this is the only Lenin monument in the capital of a Central Asian post-soviet republic. By the way, on the back side is says “Leninism is the route to the emancipation of Eastern people”. 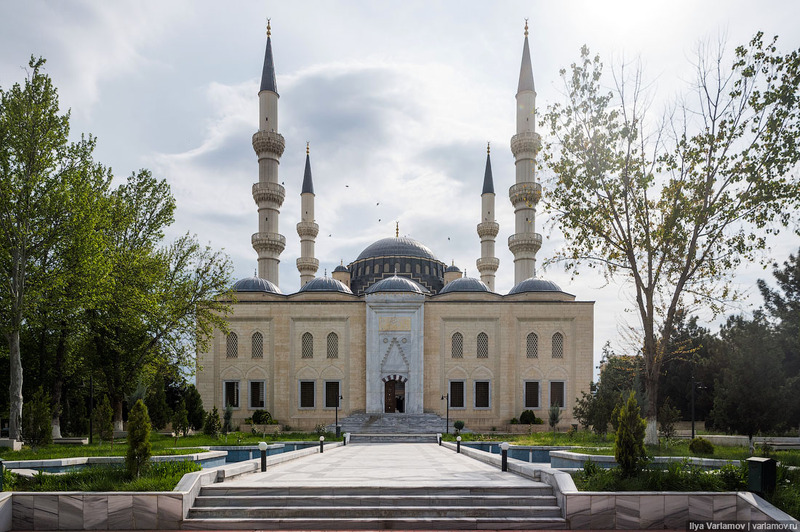 The Ertogrulzi Mosque built in the Osman style. 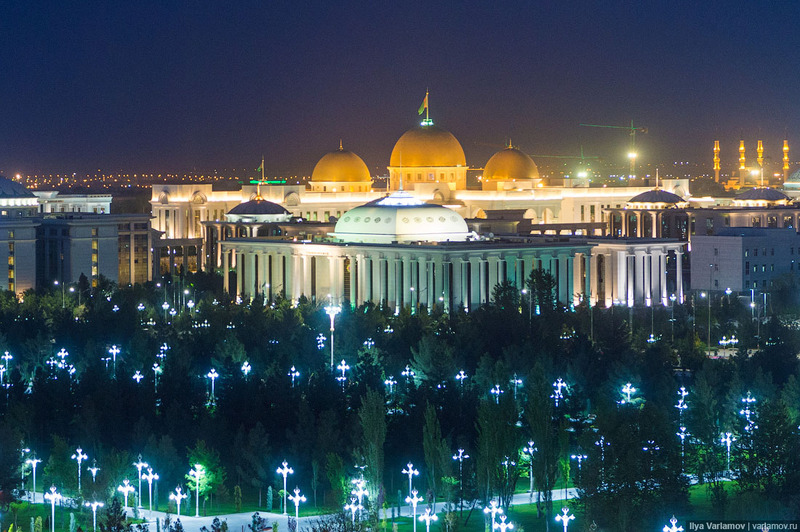 This is the largest mosque in Ashgabat. 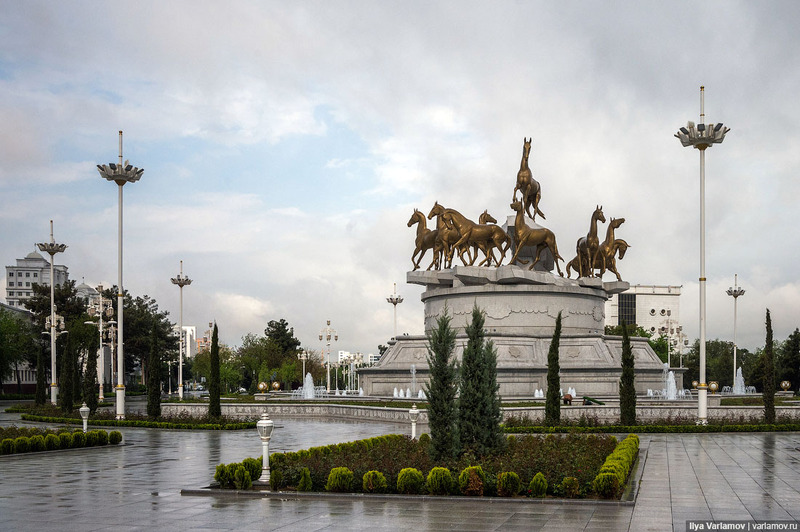 Right after Turkmenistan became independent it started making friends with Turkey. 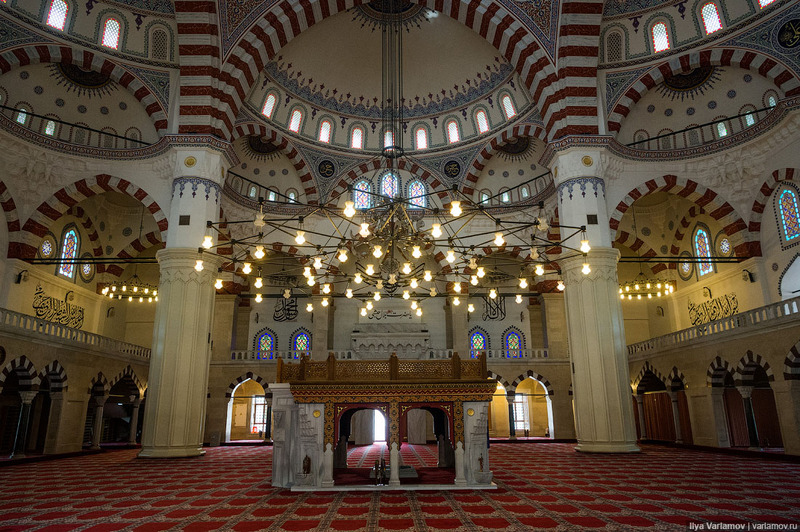 Through this friendship the capital received a mosque in 1998, built by a Turkish company at the behest of Turkish prime-minister and dedicated-to-Osman leader Ertuğrul. 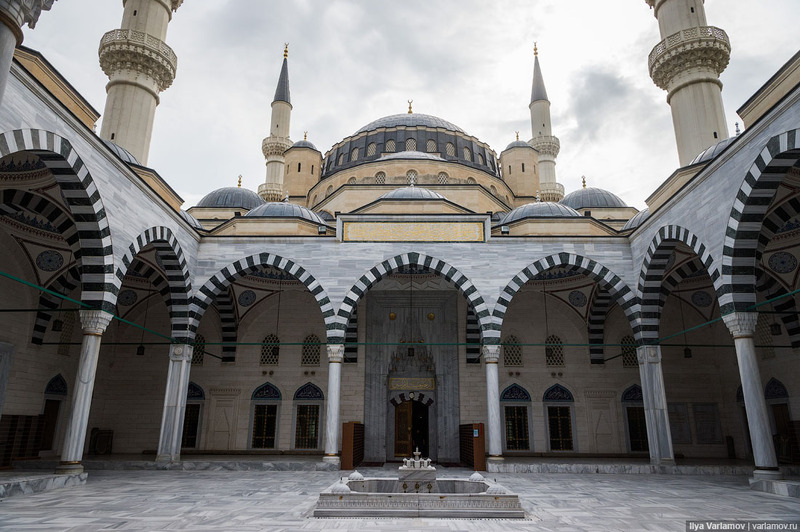 The idea was for it to be similar to the Blue Mosque in Istanbul. The locals believe the mosque “brings bad luck”, because several people died during its construction. I cannot say if this is a strong belief, but the mosque was empty. To be honest, Islam forbids superstitions (as do other religions) and the mosque was likely empty because it wasn’t time for prayer. 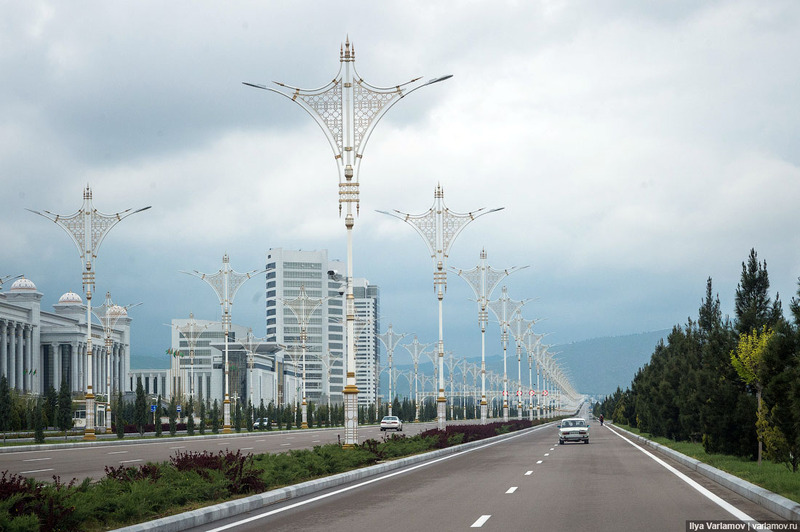 They say on Fridays it is so full that there are even rare Ashgabat traffic jams. 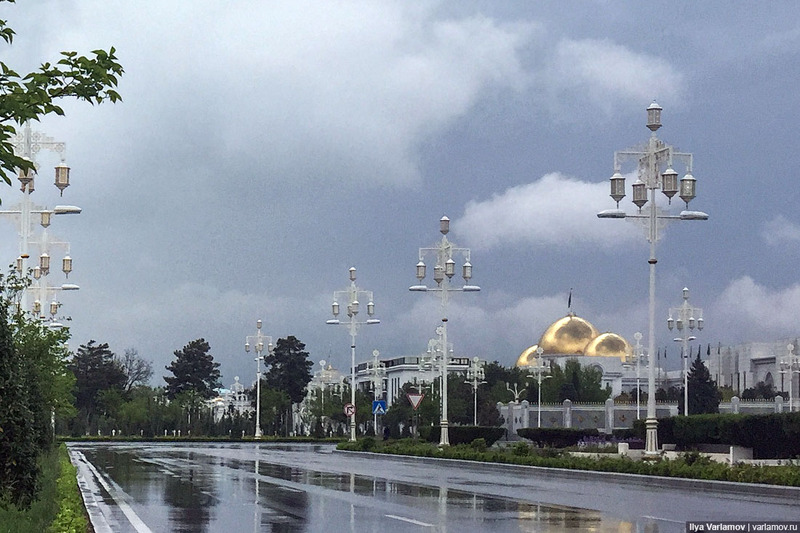 Ashgabat is incredibly clean! 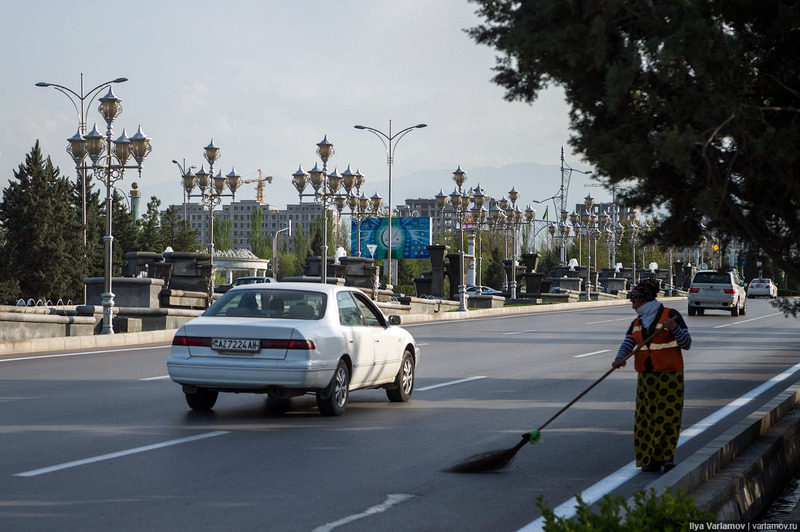 The locals joke that it is being swept 25 hours a day. 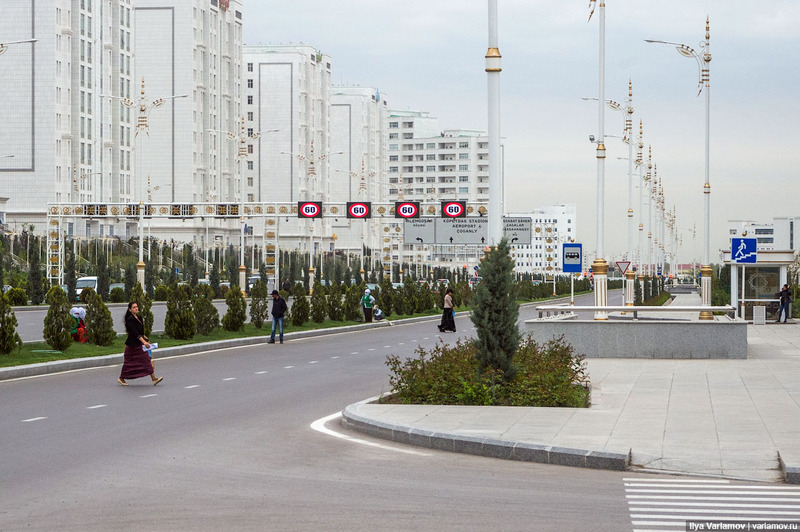 For several years already Ashgabat has lived without trolleybuses. 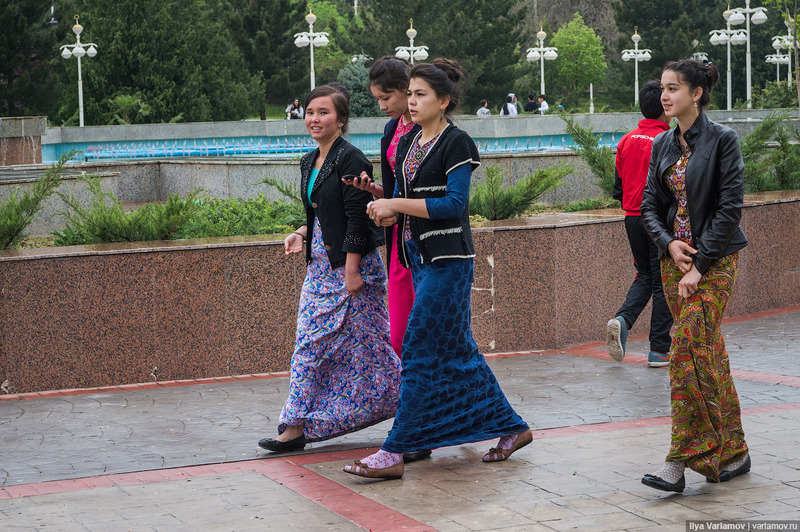 They drove in the Turkmen capital since 1964. 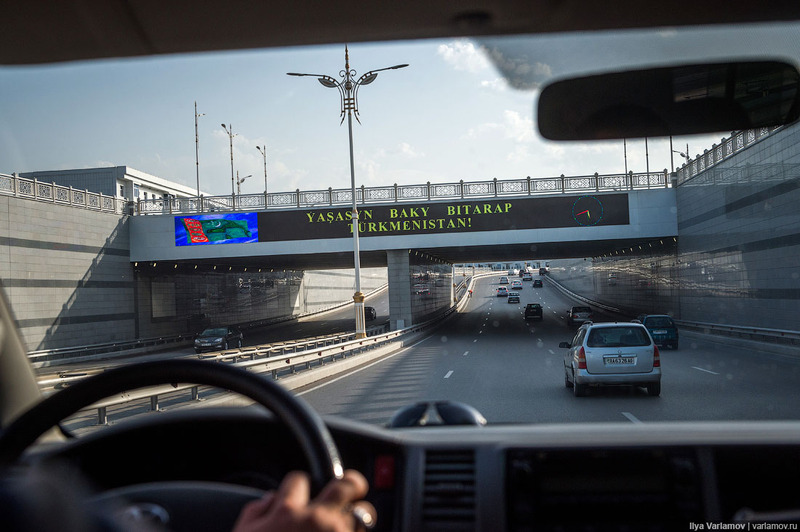 New routes were being opened until 2000, and then the process was reversed. Prior to the closing of the last trolley network on January 1st, 2012 there was just one route in the city. Route cutting was initially explained by repair works. The network was promised to be restored and even optimized but the trolleys just stood idly at the depots. Instead, buses were released onto the streets. The locals weren’t too happy about this. According to 2012 reports, buses are not very comfortable: “Trolleys were operating to 11 pm. And buses just weren’t there after 8. 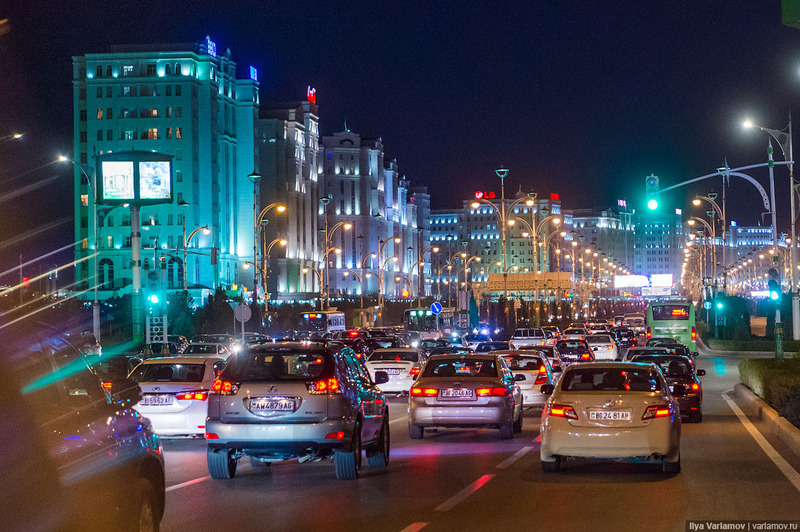 The drivers probably drive off after the peak hours of the evening to make money on the side”. This meant leaving the route and working for your own gain. 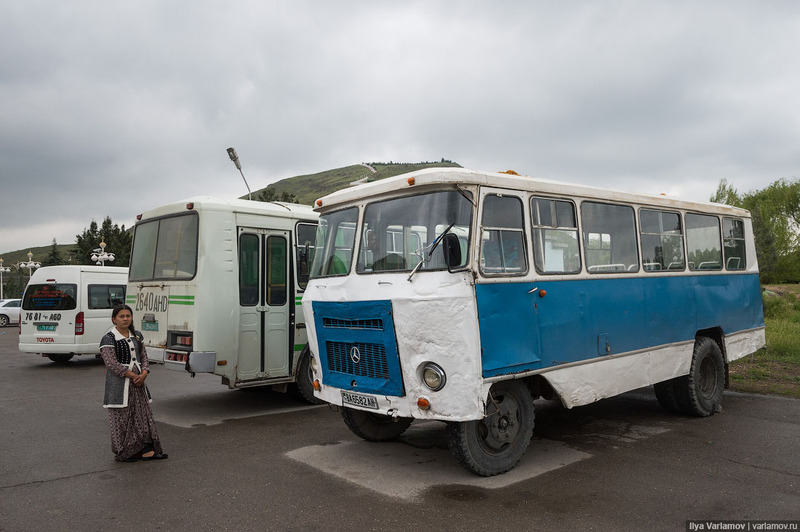 The locals say if one is around to catch an evening bus, the fare is twice the daytime price. The drivers do not deny it, saying that their bosses make them do it and pocket the difference. 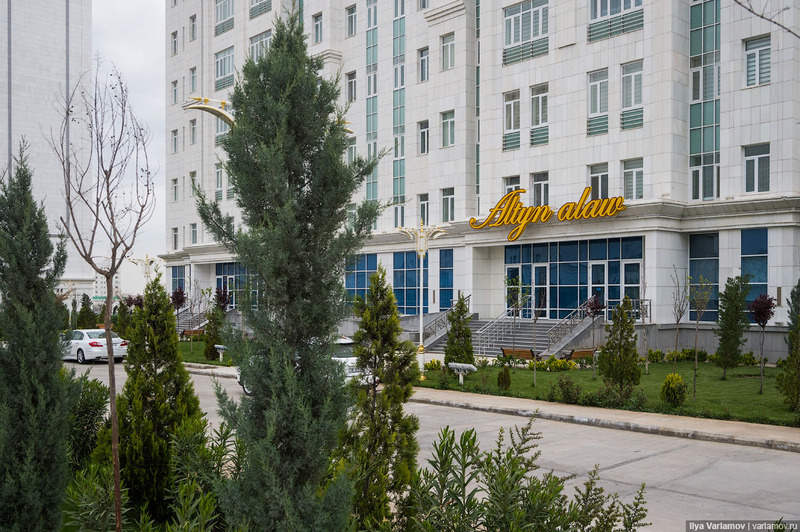 It is still unclear why Ashgabat authorities had cut the trolleys. 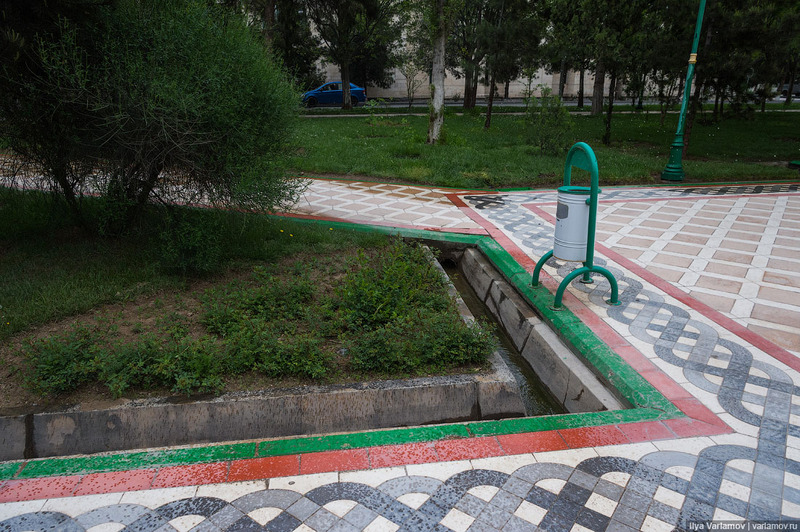 The locals believe that Berdimuhamedow cares about the look of the city so much that he removed the trolleys to remove their electrical wiring. There is another explanation. 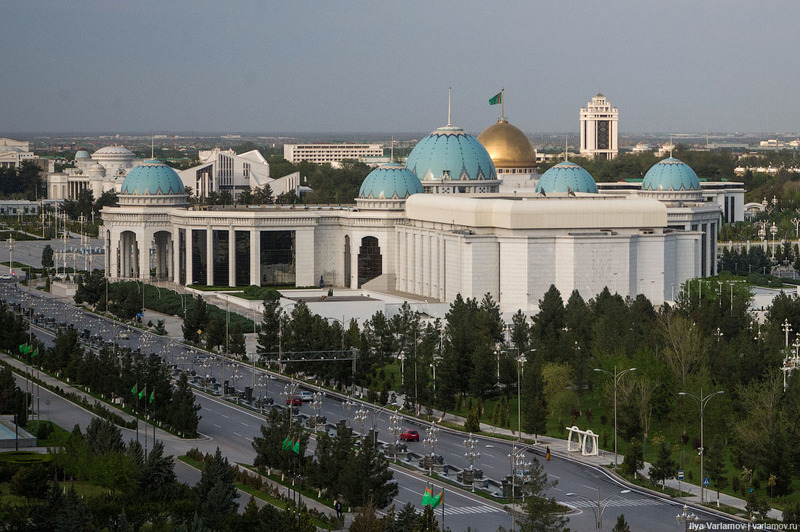 Every morning and every evening Berdimuhamedow goes to and from work. All traffic stops at this time. 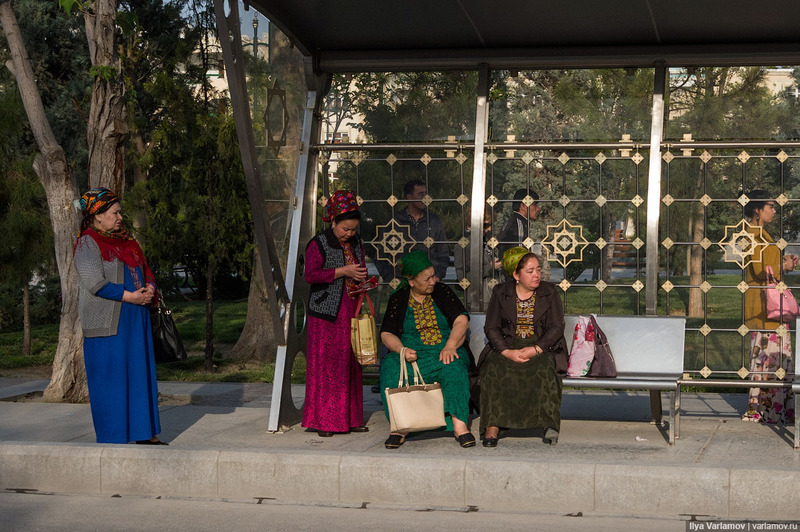 Hiding from the president, a bus can easily swerve to a side street, a trolley - not so much. So it was decided to cut them. 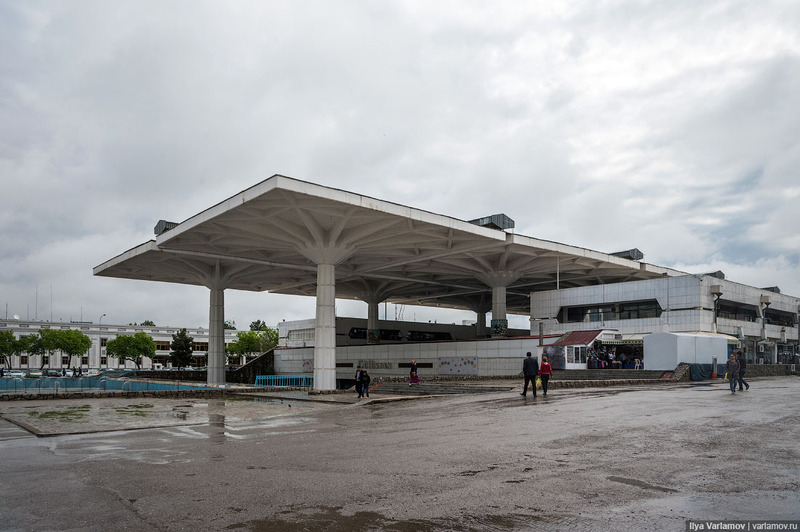 Main railway station. No filming as well, shot from far away. 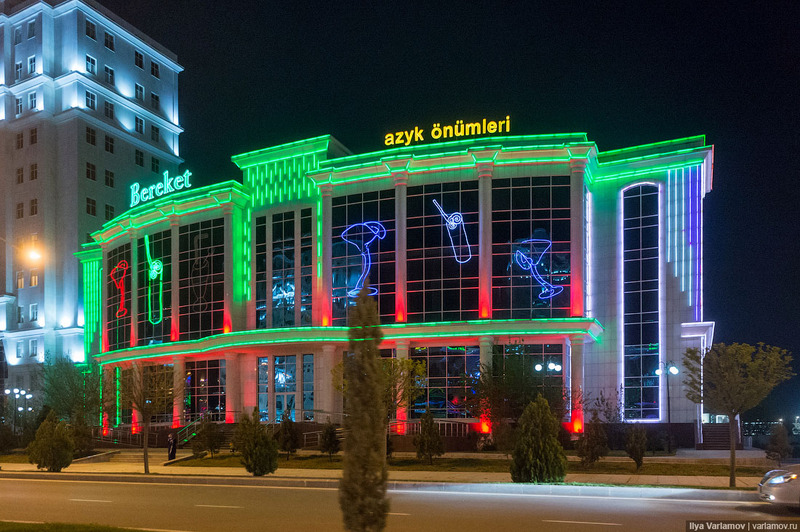 One of the main attractions of Ashgabat is the city market, also known as State trade center “Gulistan”, also known as the Russian bazaar. 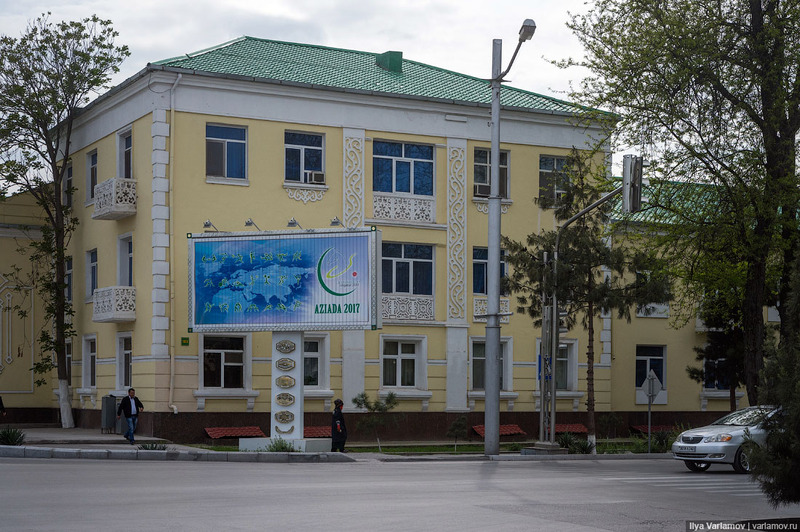 If the giant “Altyn Asyr” is a hard goods market and the main place for selling rugs, people go to the Russian bazaar primarily for food. 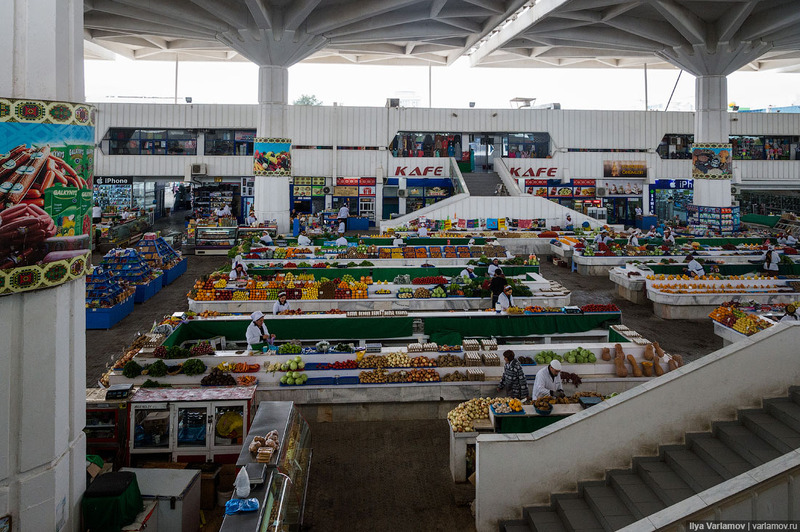 The bazaar is famous for its melons, smoked fish, and an assortment of national breads called “chorek”. They say there used to be black caviar for sale here for $750 per kilo. Now black caviar here costs $1000 per kilo, while also being contraband. But at this price you can get legal caviar in Moscow. 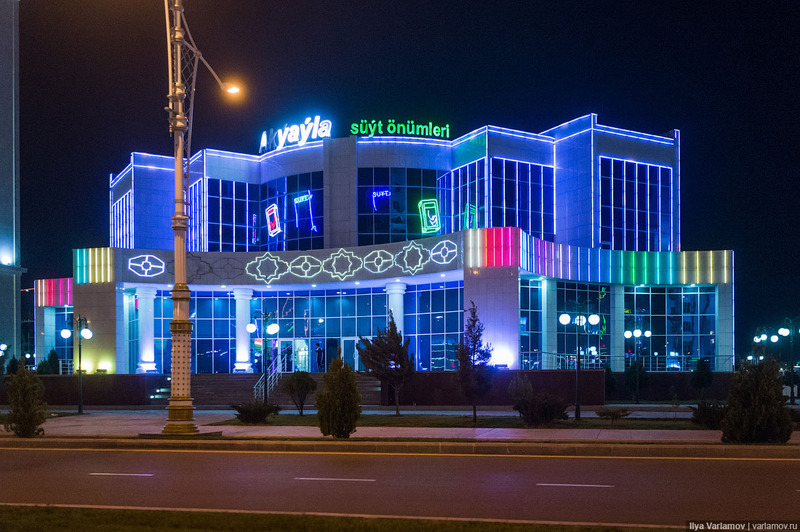 Also, this is one of the few places in Ashgabat where you can buy street-food. 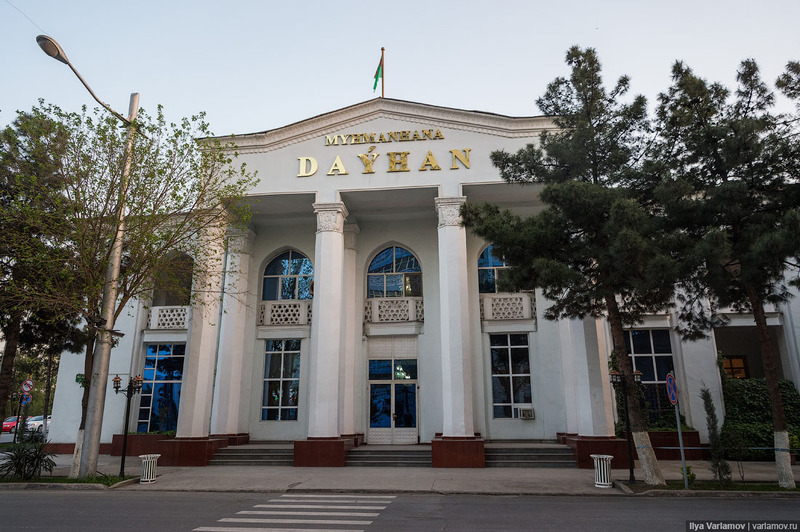 The bazaar building dates back to 1982, but in 2001 it was faced with white marble by some Turkish company. 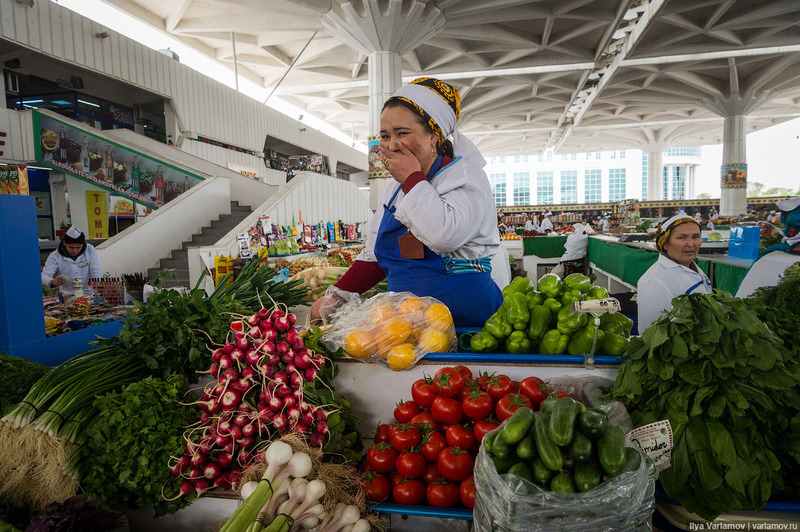 Under Turkmenbashi the market was considered exemplary, a must-see for any foreign delegation. Even Putin has been to the Russian bazaar. Berdimuhamedov kept this tradition, in part. 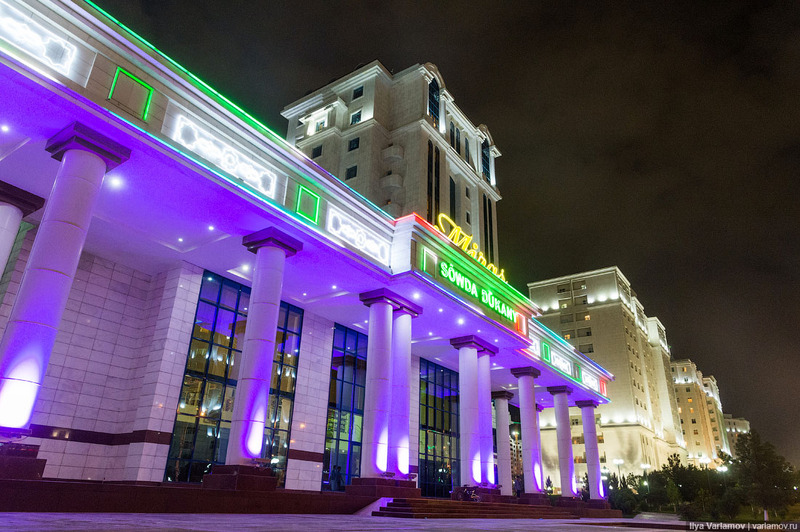 Also, under Turkmenbashi this was the main “office” of money mongers, something like two dozen people constantly sold dollars, rubles and euros here. 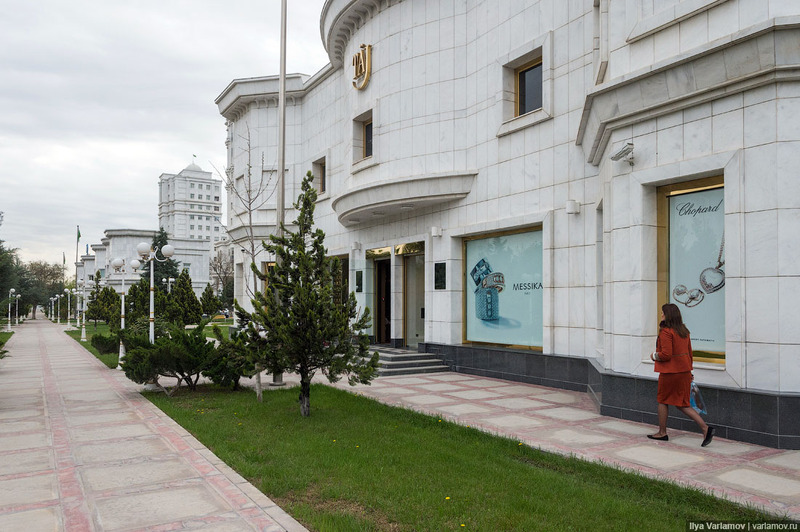 Now this activity is banned, the foreign currency black market is very small, and the authorities are cracking down on it hard. 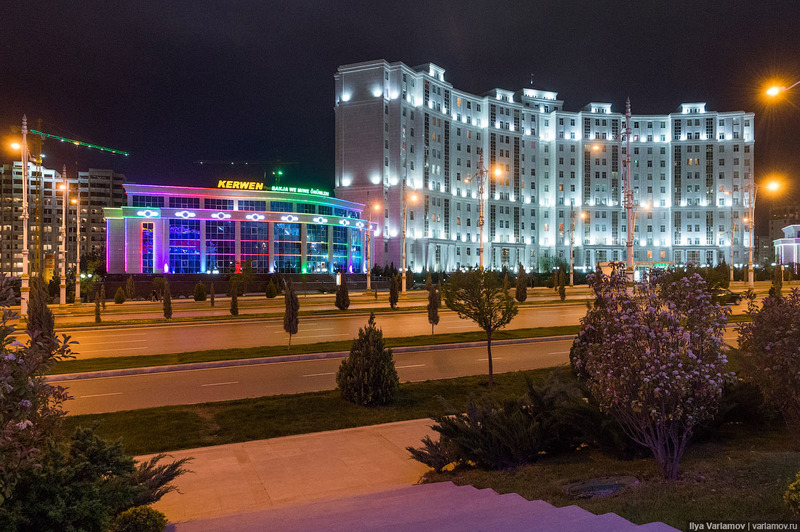 Ashgabat used to have two large markets – Tekin and Russian. 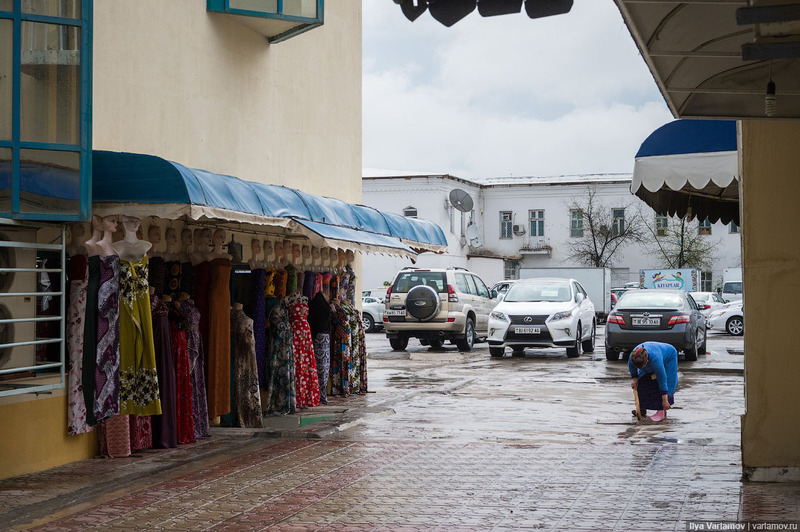 Local traders sold their wares at the Tekin market and other nationalities sold at the other one. That would be Russians, Azerbaijani, and Armenians. Now there is no such division among traders. The market burned down in 2007. Traders say that the fire begin around 1 am but firefighters showed up only in the morning, despite the lack of traffic. Some think this was arson and the main beneficiary was the mayor. His office was renovating the hard goods market and wanted to chase out all trade so as to complete the works. However, they were afraid to commit to it, knowing how popular the market is among the people. The fire bankrupted many traders, they lost all their goods. Clothes are now sold on the periphery and the market is mainly for groceries. A health trail on the outskirts of the city, 36 km long! 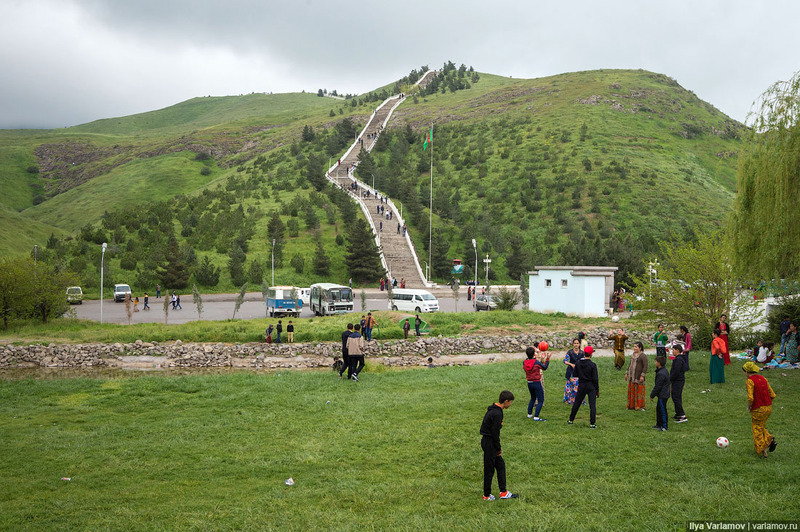 Opened by Turkmenbashi so that people would hike in the mountains and stay healthy. 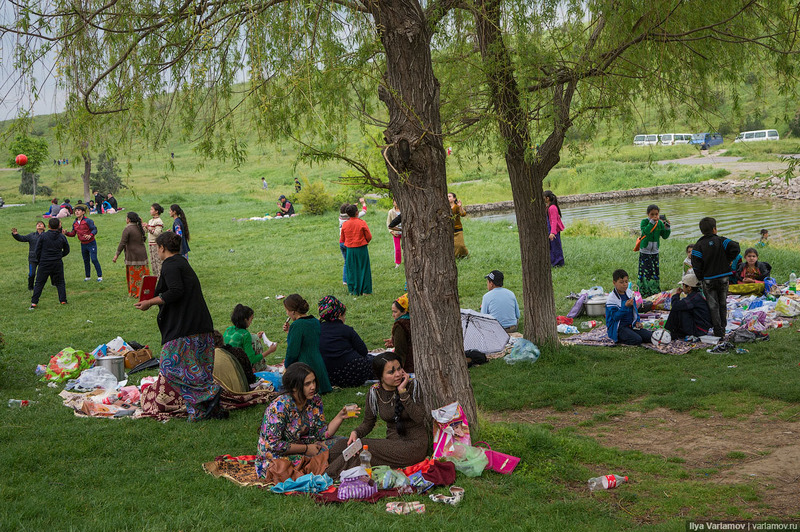 On weekends the locals picnic in the park by the trail. This many people in one place looks unusual. 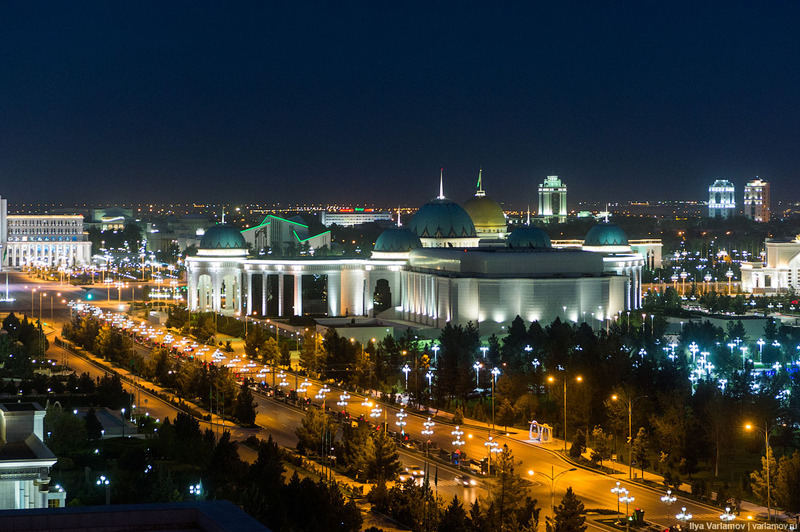 This is rare for Turkmenistan. Usually people do not gather in such groups. Girls mainly wear dresses. I saw almost no one wearing jeans. 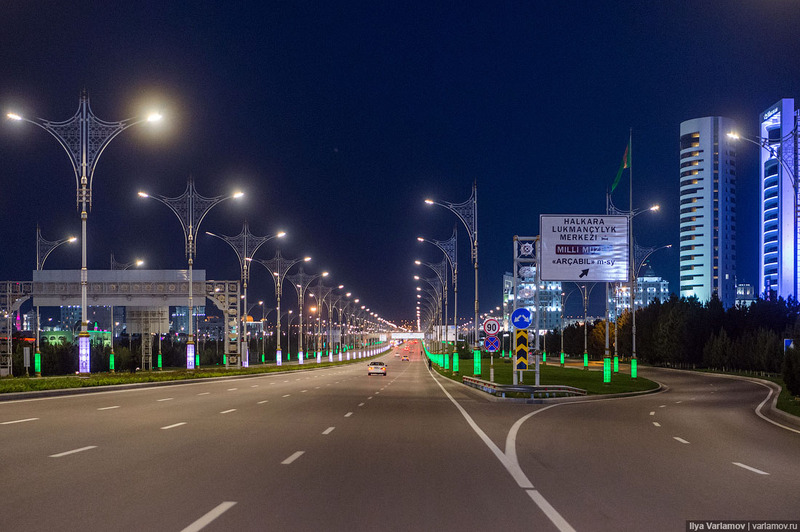 There is no traffic in Turkmenistan, unless the road is closed for the passage of the tsar. Мне очень нравится! Шикарно, пафосно с восточным колоритом!... и что не маловажно - не на российские деньги.)) 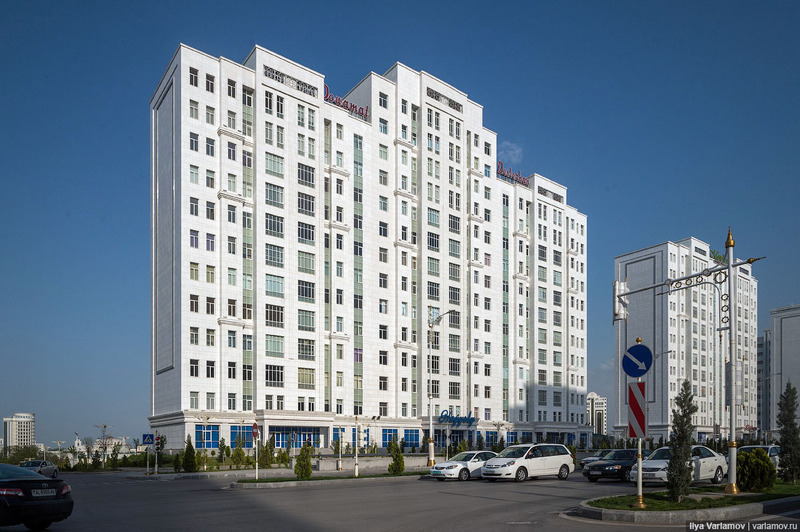 Очень жаль, что здесь не жалуют туристов. Хотя, наверное, это и правильно. А то понаедут толстожопые американские тётки с белых шортах... или разные вандалы любители граффити из стран бывшего СНГ. А что окраины ещё не благоустроенны... так и Москва не сразу строилась. Не забывайте, что это другой менталитет, мусульманство. Я, так, напротив, по женскому полу туркменок вижу слишком много прав и свобод в их образе и поведении. Видно, что бабы довольны своей жизнью. А довольная баба - это и есть благополучие страны, где она проживает. Так что тут с корейцами сравнивать не надо. Лучшим примером будет, сравнить себя... с ними. Интересные фотографии. И интересные люди. Ху здесь спикинг инглиш уэлл? Задолбал уже со своими корявыми английскими переводами. 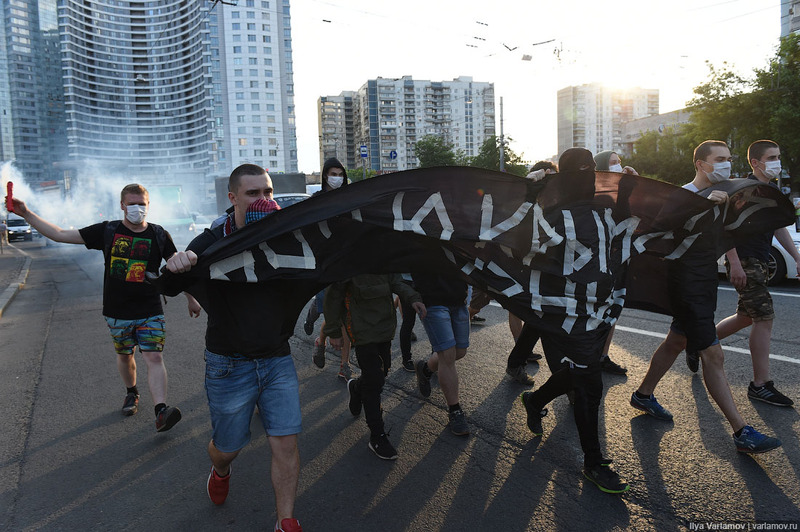 Типа, вся Америка прямо кинулась читать Варламова. Однажды я ссал в рот одной козлодаразине. Почему бы не ложить переводы постов куда-нибудь отдельно? 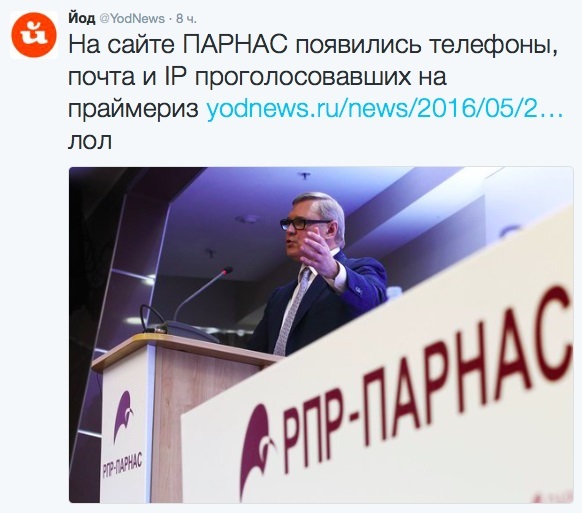 Зачем выкладывать одно и тоже заново на главную?